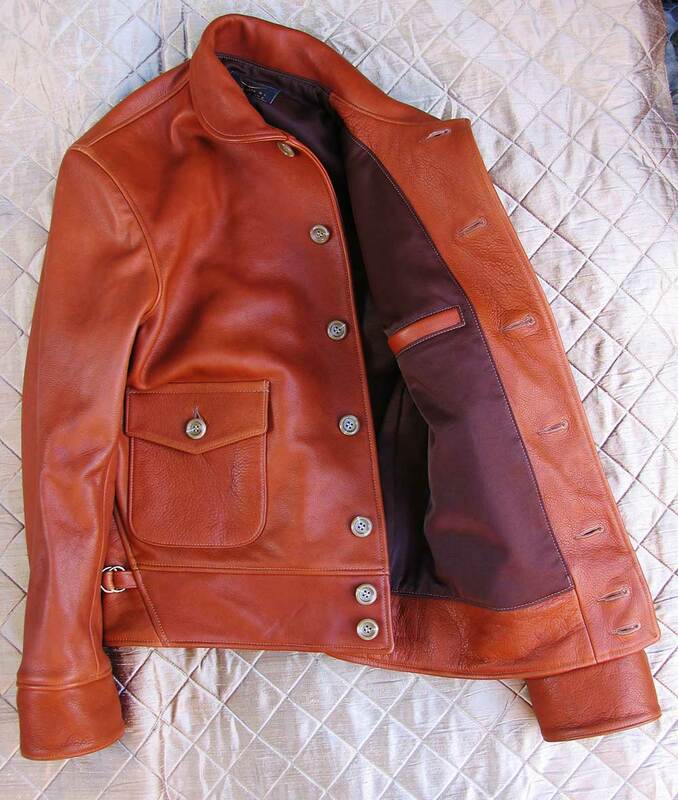 LOST WORLDS Limited Editions are Brand New, current manufacture jackets/accessories only (but significantly) limited by the amount of remaining materials in stock or by availability of special hides. 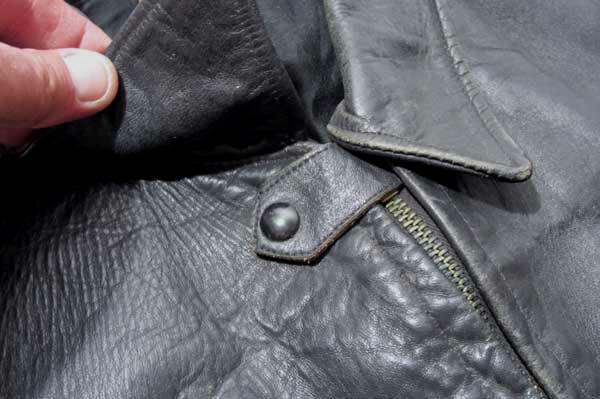 As we have a very select and interesting inventory of Leathers, Rayons, Cottons and Wools, customers have the opportunity to obtain virtually one-of-a-kind LOST WORLDS pieces unavailable elsewhere and never to be repeated because the materials are often irreplaceable. 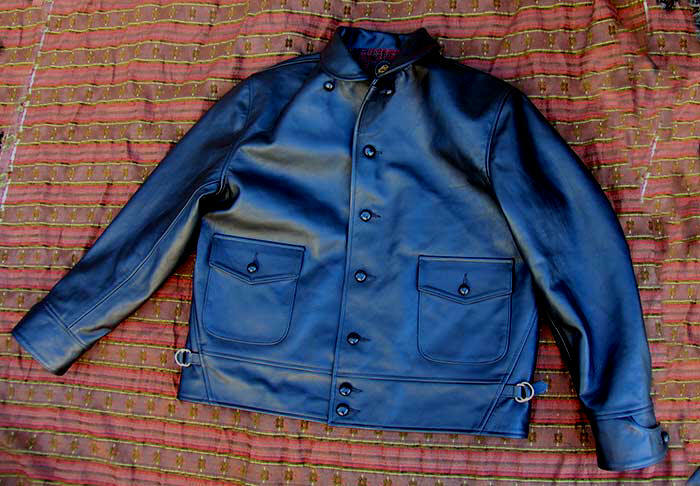 At the same time we're offering these Limited Edition jackets at excellent prices so that customers can really take great advantage of these small footageyardage rarities. 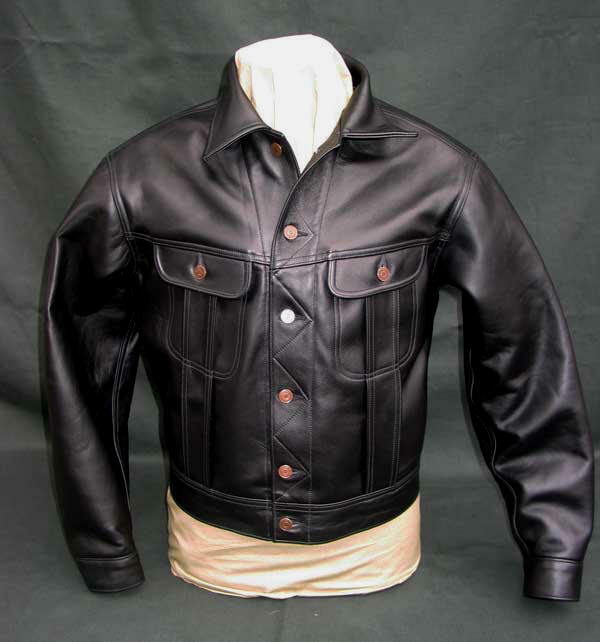 The National Racer dates back to 1998 when we did a very small, very expensive run for a French and Japanese shop working together to feature an exclusive Lost Worlds gem -- a dashing post WW1 civilian flight jacket of matchless style and performance -- evoking the era of daredevil air races and dangerous commercial maverick flying as seen in films like Ceiling Zero (1935) and Only Angels Have Wings (1939). 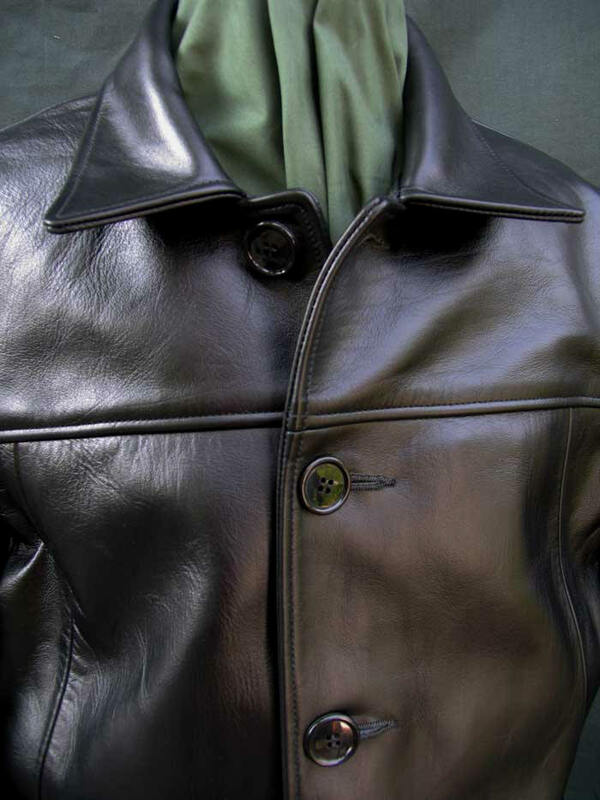 Working from old aviation photos, newsreels and mothy original sweaters, a good examples visible in Parachute Jumpers (1933) and Night Flight (1933), we produced a pattern, then a few jackets in Black Horsehide, with beautiful NOS Vintage Cotton/Wool Plaid Lining (Ltd. avail. 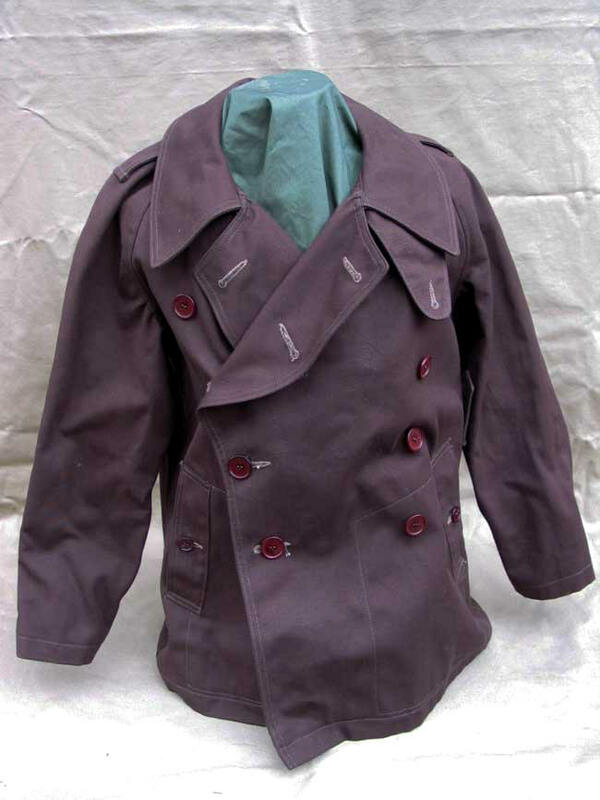 while stocks remain), Leather or Vintage Bakelite Buttons . Since then we've offered the RACER from time to time to knowledgeable loyal customers interested in something very special. 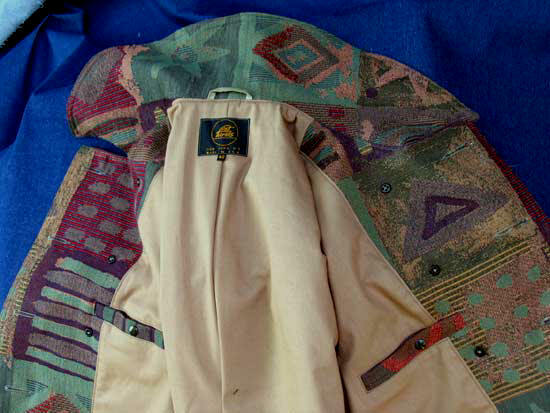 And the quality -- observe the blueprint-like way the seams match up between the two fronts above left photo and throughout. It's not an accident. It's what we're renowned for. 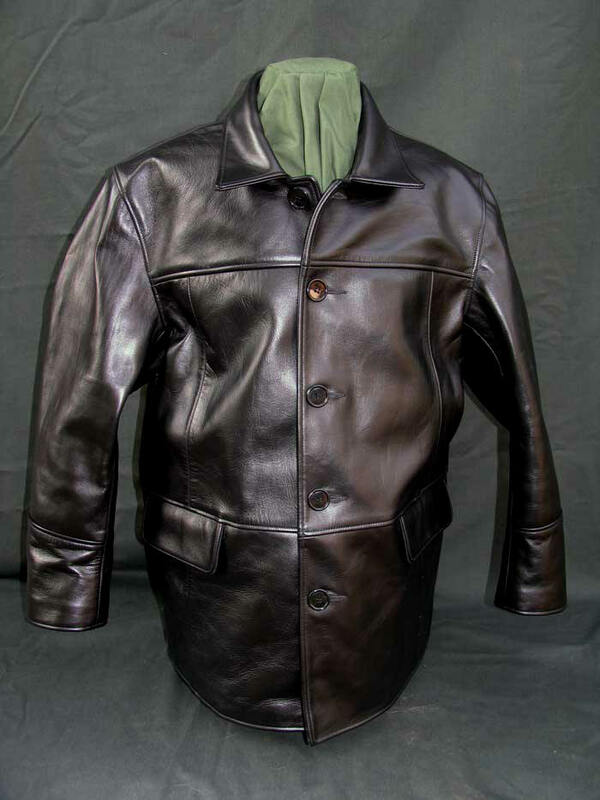 Offered for sale is a Cotton version of our new recreation of the rare 1930s "TEST" Motorcycle Jacket. 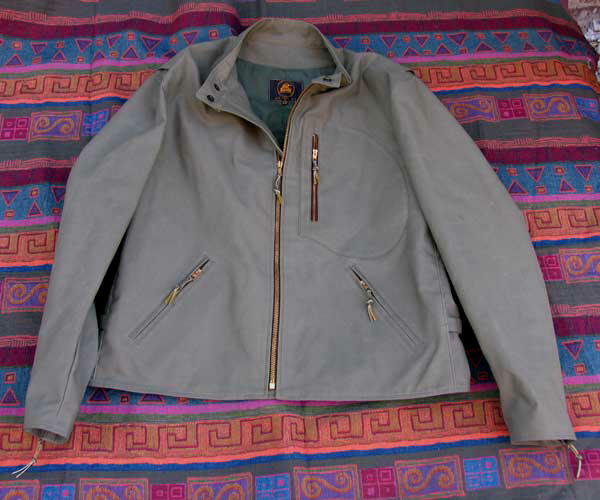 Reproduced from scratch, the "TEST" necessitated a complete new pattern rather than one modified from an existing LOST WORLDS jacket. Accordingly, to ensure it was dead perfect we made the initial"TEST" in stout, period correct 15oz. 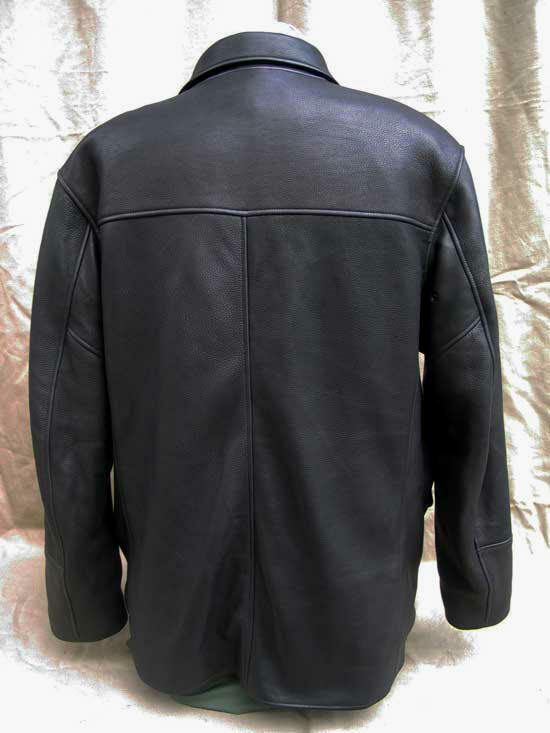 Black Cotton Duck (shell and lining) before we made the Horsehide version and it proved so perfect in fit and look that it immediately morphed into a production jacket! For reference we include here pictures of the original "TEST" so you can see how dedicated our reproduction is. We selected 15oz. Cotton Duck because it closely replicates the orig. 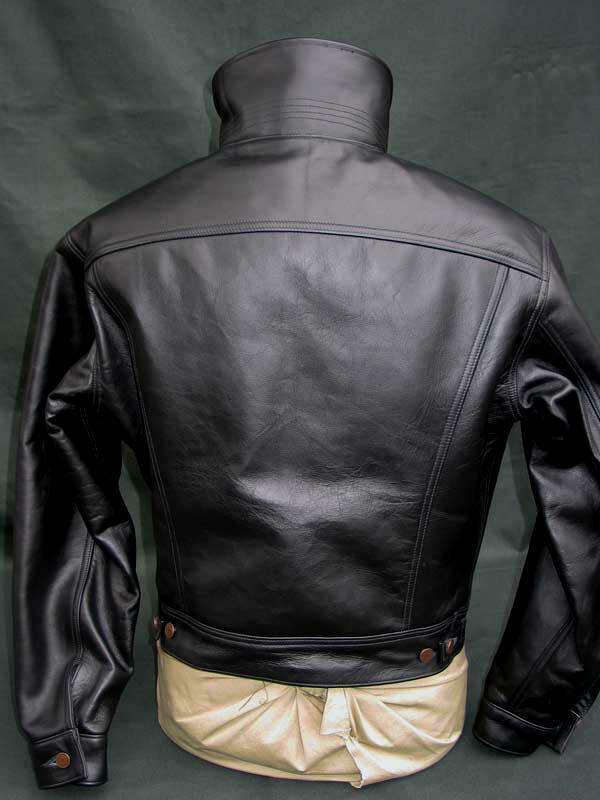 leather jacket's lining and used it for lining and shell to give some idea of the heft and fit of the Horsehide final version. 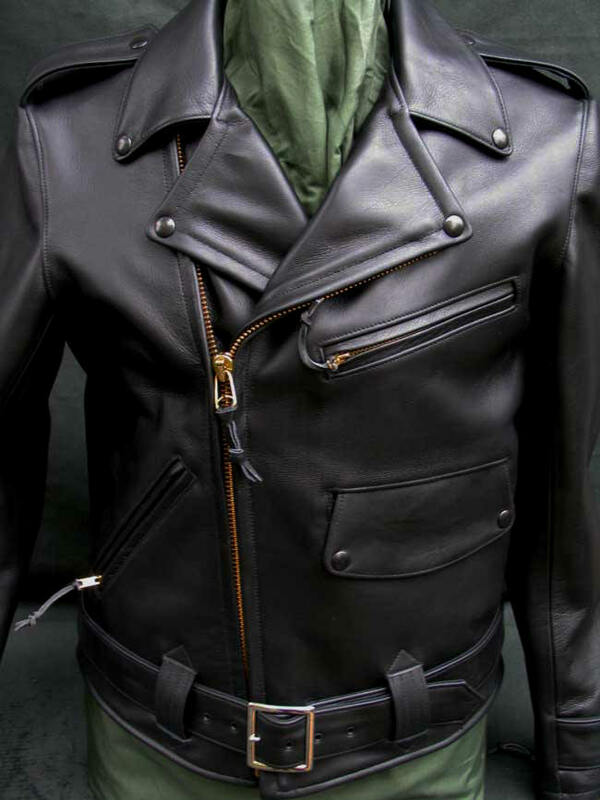 Genuine Nickel Talon Zippers with waist eyelet reinforcements, 100% Wool Interior Storm Cuffs. 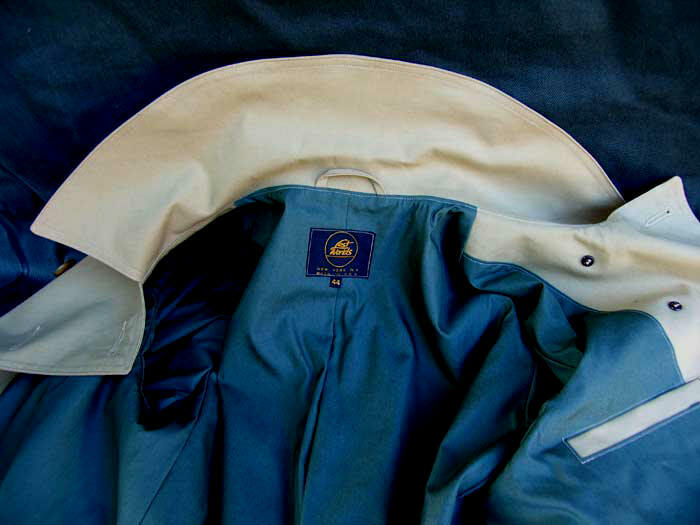 Every stitch, detail of the original. 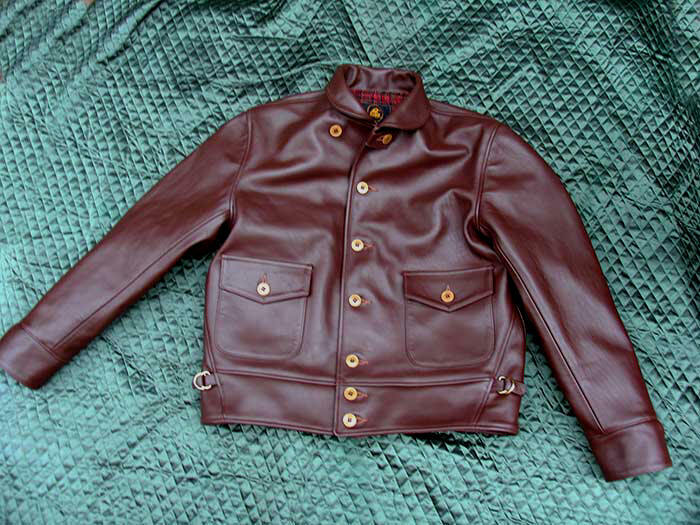 Trojan Motorcycle Jacket 46R, Cotton Duck/Sheepskin. This Custom Trojan is the last of a small, one-of-a-kind production run for a vintage motorcycle club. 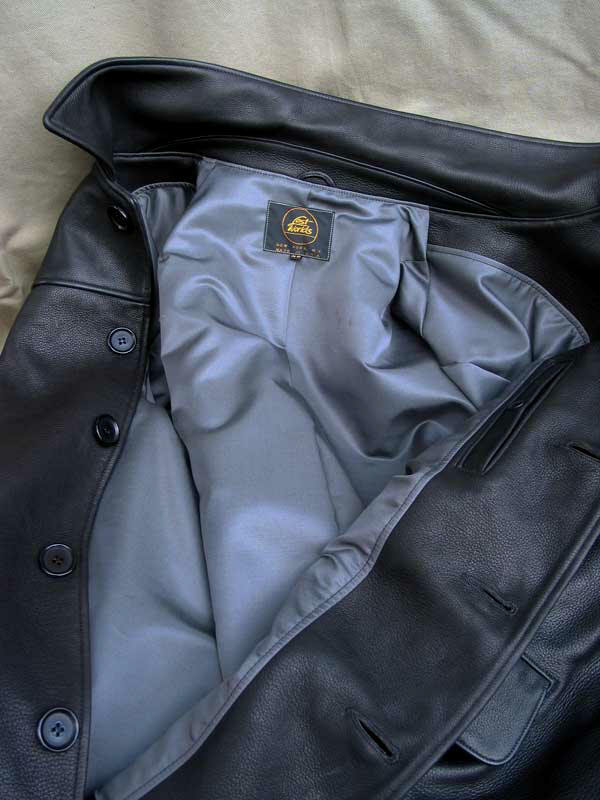 The guys wanted a unique Lost Worlds design that offered both comfort and warmth with a fully different look and feel while preserving the detailing, build quality and aura for which we are renowned. 15 oz. 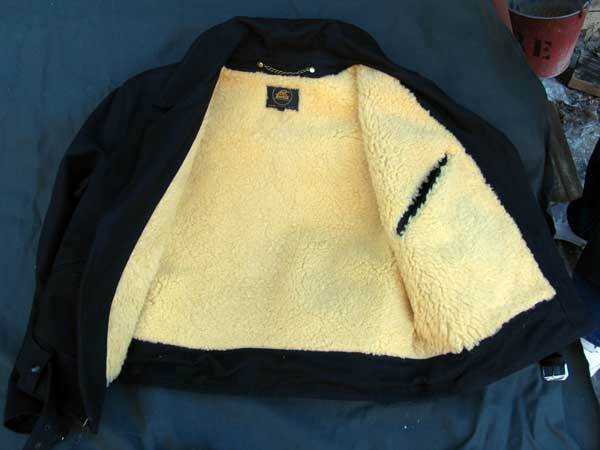 Cotton Duck was an obvious choice coupled with thick American Shearling. 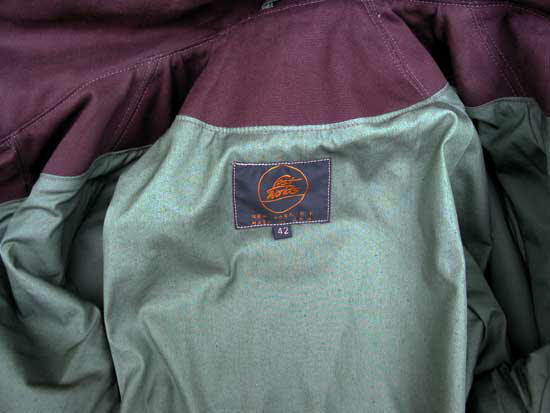 The club had us fabricate genuine Wool Chenille patches for front and back to complete what to us and them was a fantastic Lost Worlds jacket of solitary provenance. 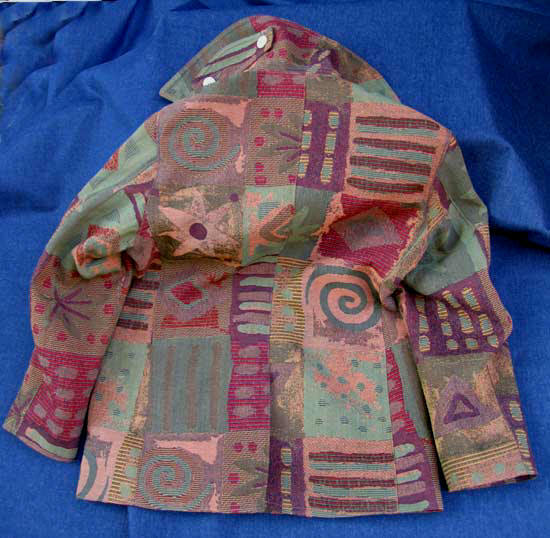 A unique, one-off LOST WORLDS original, adapting our classic PEA COAT to a different fabric -- here, New Old Stock Vintage Tapestry Cotton/Silk/Rayon. We hate terms like "retro" -- convenient, general tags -- but this gem has a kind of 1960s vibe, intentionally so. Yet without camp or kitsch -- this isn't swishy, it's very cool. It makes a statement of individuality. One thinks of Hendrix, Clapton (in his brief prime, not the current likable but unimportant crowd pleasing guitar entertainer he became after the brief flourish of youthful genius), Steve Marriott, others. 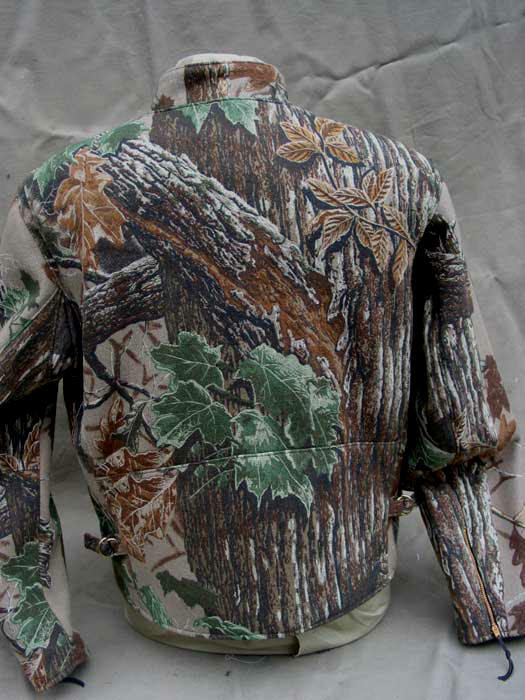 To add to the mystery and mystique we use genuine rough-cut deer antler buttons. 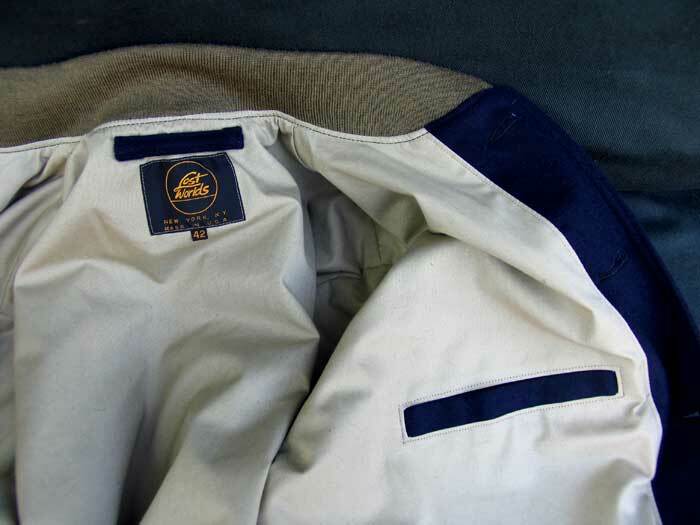 The lining is Tan Cotton Twill, moleskin pocket linings. 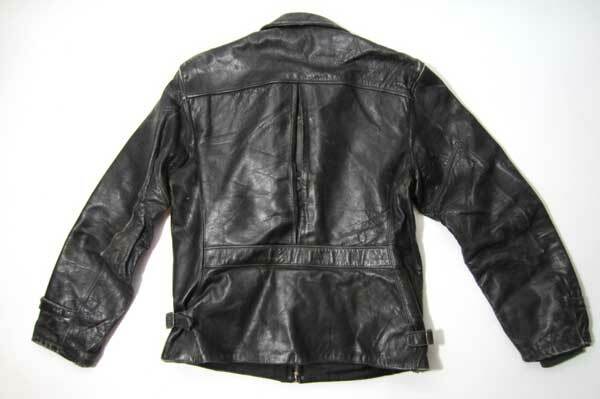 This is sort of a jacket that a luscious rock and roll seamstress would make for her fave 60s icon back then during the brief period when rock meant something -- for those who aren't up on these things, rock died around 1968. Woodstock and Tommy were the final nails in the coffin. 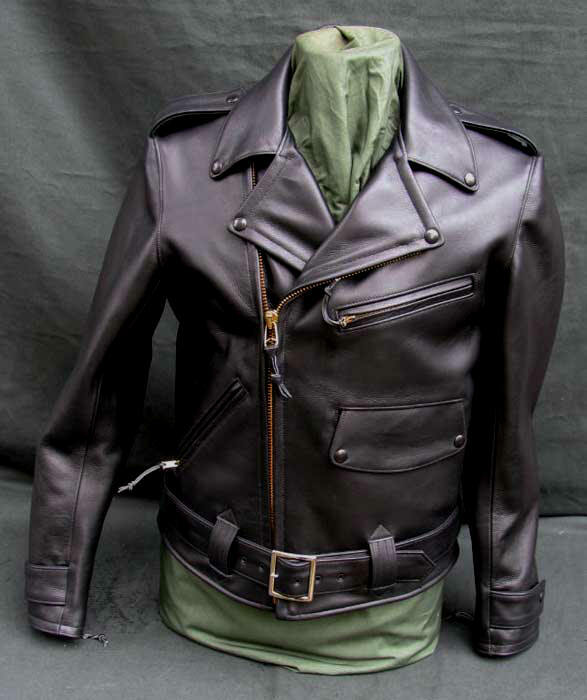 A special edition of our BUCO RIDER MOTORCYCLE JACKET done in our exclusive, limited USAF NOS (1982) Sage Sateen 100% Cotton, Waterproof and Flame-Retardent Finishes. 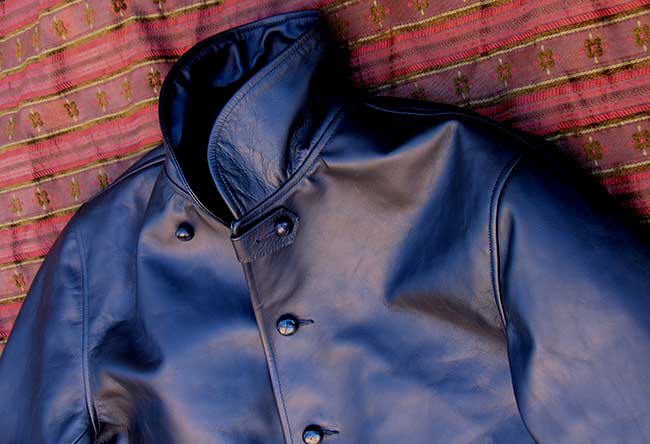 Lined in our now extinct US Military Cotton/Nylon Oxford, Quarpel Waterproof Finish. Genuine Vintage Brass Talon Zippers. 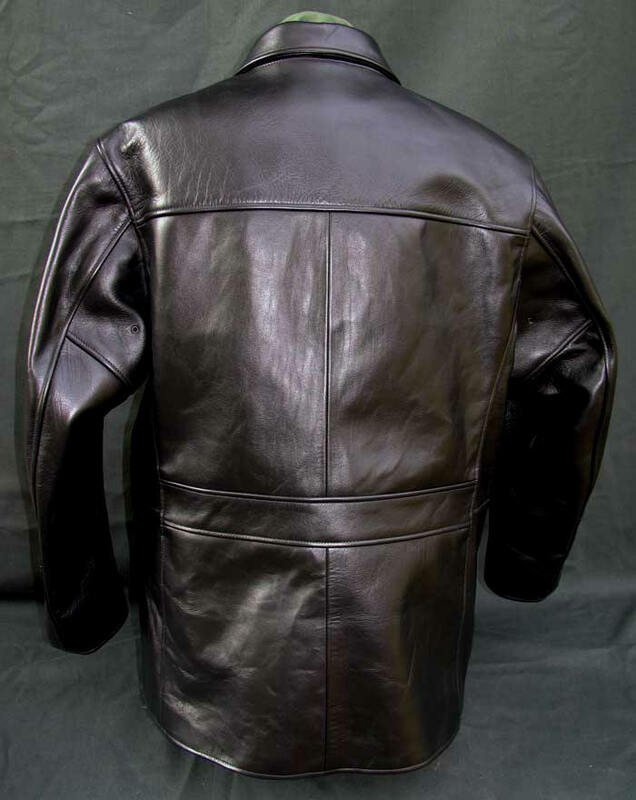 A fantastic variant of our famed Horsehide Motorcycle Jackets for warmer climates. All reg. BUCO RIDER specifications/features. A brilliant alternative and unique. 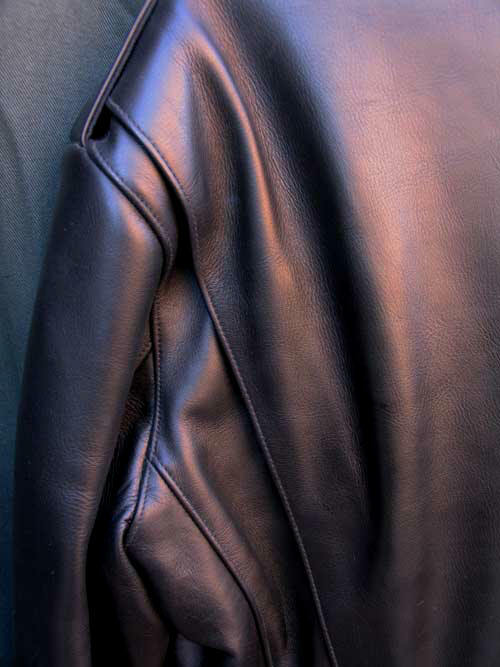 We were incredibly lucky to find some genuine, amazing Moose Hide Leather from Finland. 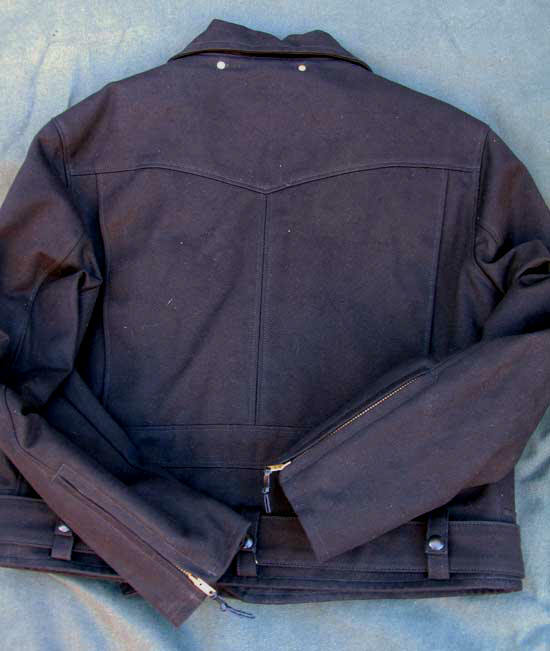 European Moose Hide is both extremely scarce and, because the animals are shot wild, extremely difficult to make jackets from because of holes and tundra abrasions. 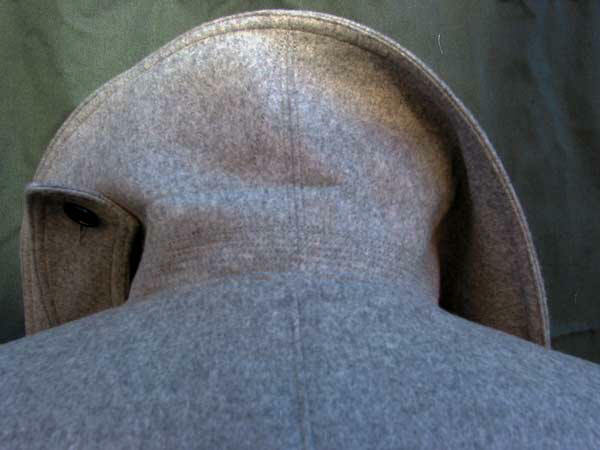 For this reason one finds Moose Hide only in small applications -- wallets, moccasins. 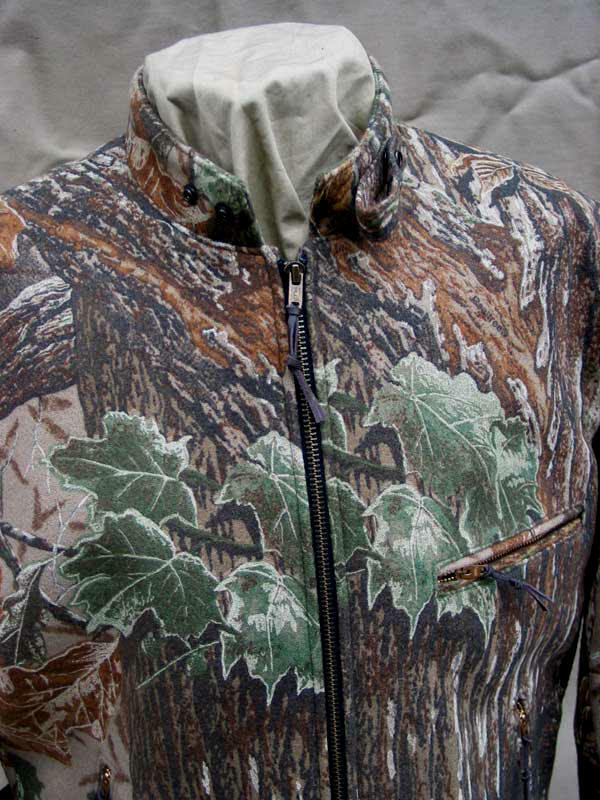 Jackets are non-existent. Until now. 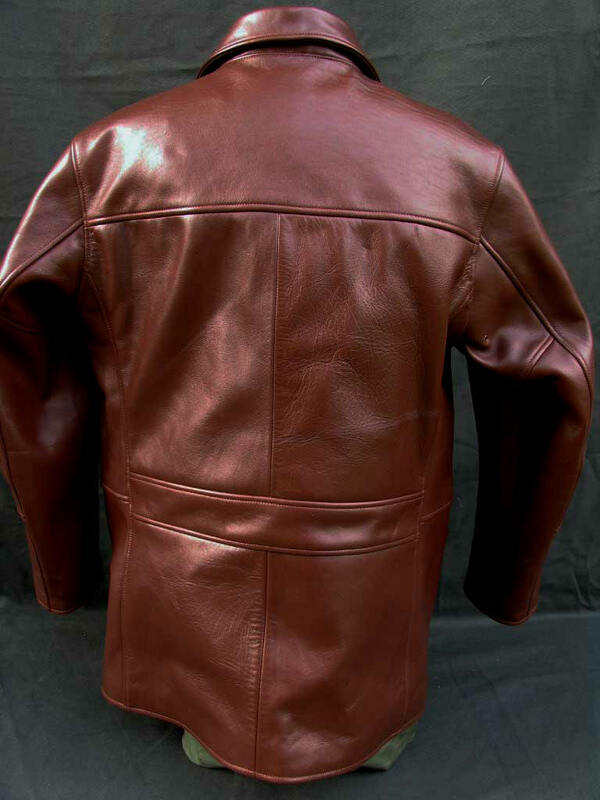 We secured a small quantity of large enough Moose Hides to enable us to use this unique leather for LOST WORLDS jackets. 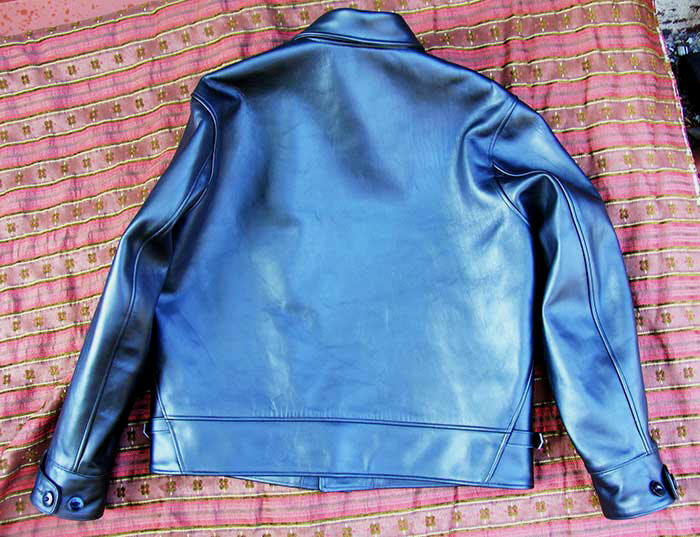 What leather! 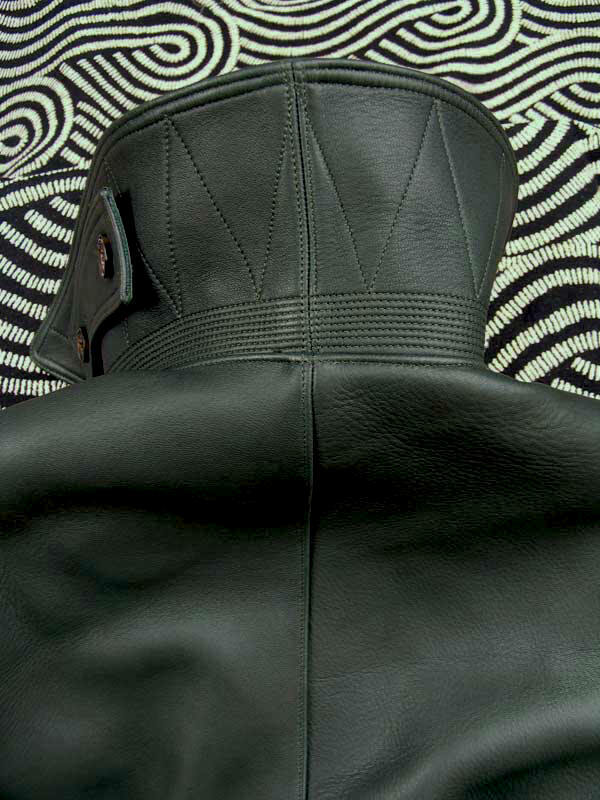 First, Moose Hide is unbelievably supple, like Deer and Elk. A softness that can't described. You have to experience it. Sort of like memory foam that's been to boot camp! 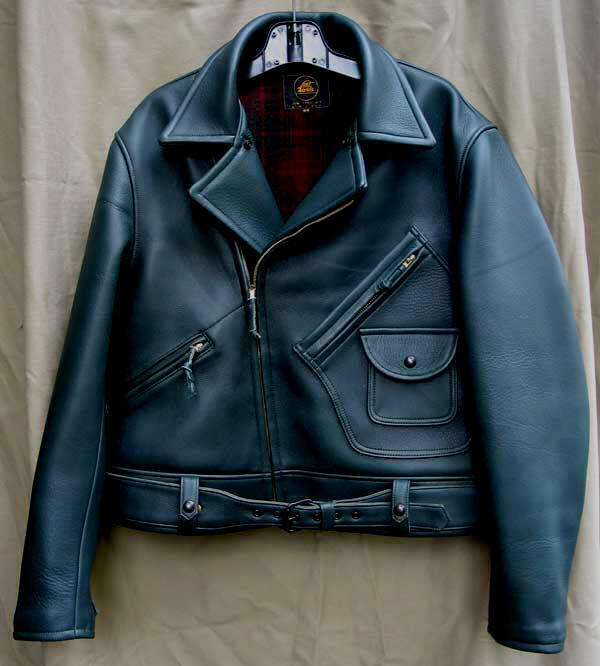 Because as soft, mobile, as it is, it's also monster-heavy -- 5 oz., heavier than practically all our Horsehide. Yet with wondrous drape and comfort. 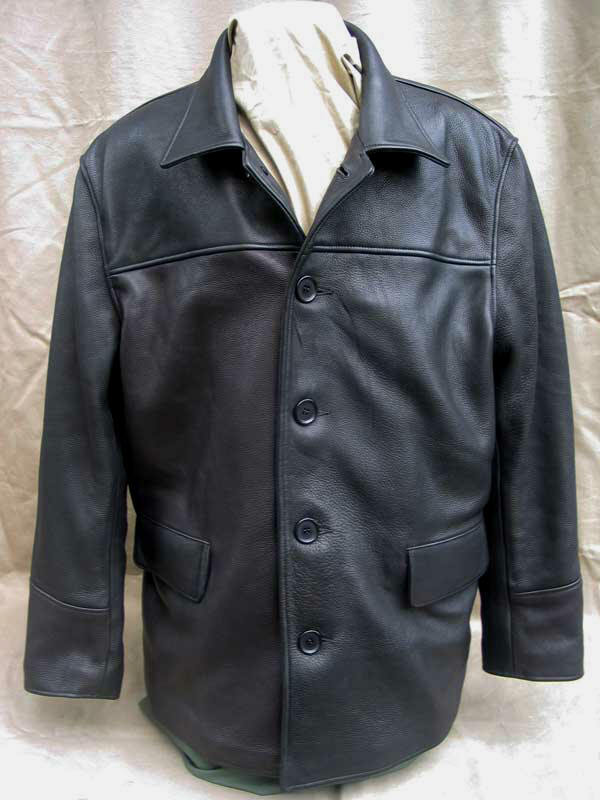 And while there are some similarities, the Moose Hide grain is smoother and finer than Deer and Elk -- no small compliment because the latter are truly leathers without equal themselves. Rarity and quality like this doesn't come cheap -- or does it? 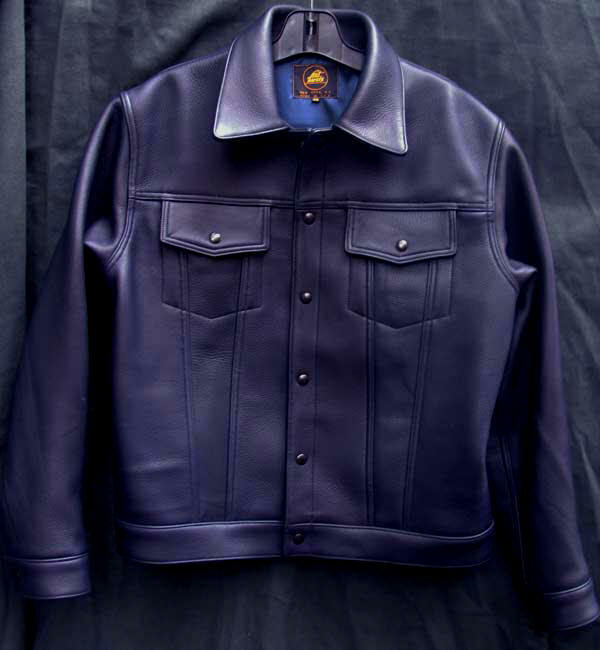 For at $1500.00 this LOST WORLDS masterly JEANS JACKET couldn't be duplicated at any price if you factor in our peerless craftsmanship, eye for detail, pattern and fit. 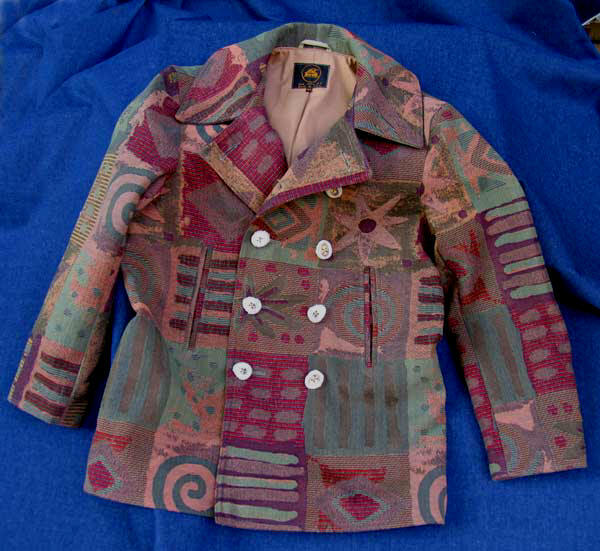 This jacket is an heirloom. Yet it's also highly durable and high performance. It ain't girly one bit, although they'll have their hands all over it! It's that special. It's THAT special! 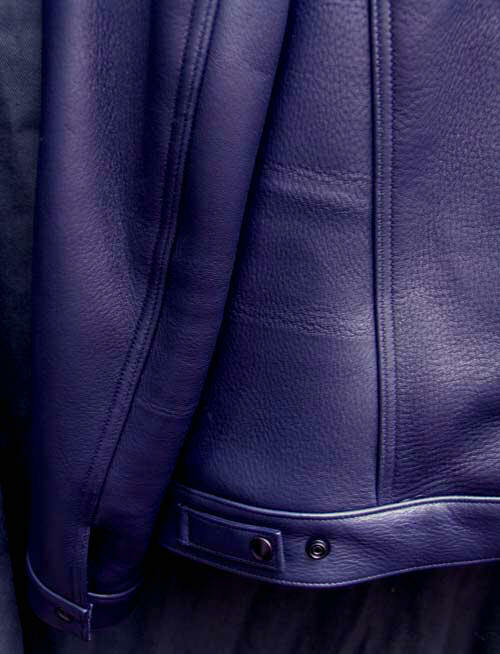 Lined in striking Royal Blue Nylon Satin. 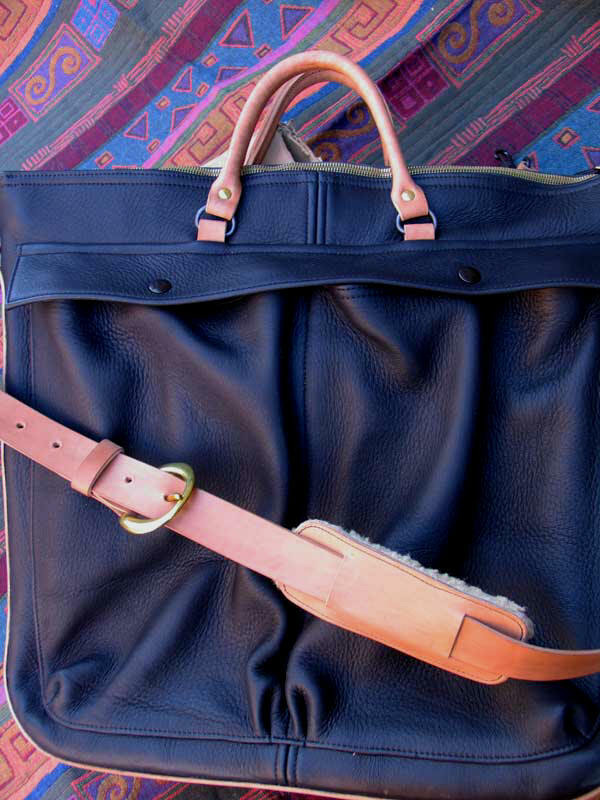 Our fantastic original COURIER BAG in Custom Finnish Navy or Evergreen Moose Hide. Unbelievable strength, softness, beauty and scarcity. 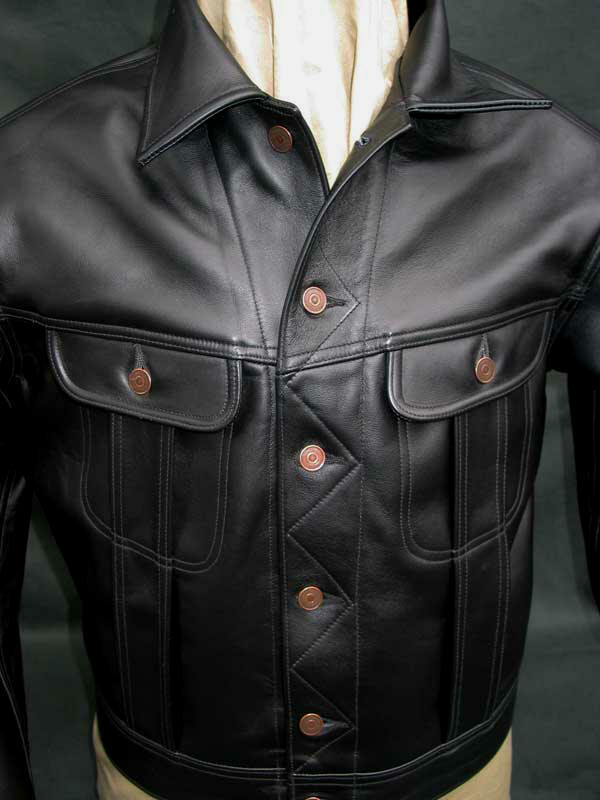 All specifications, hardware, materials as in the Regular Production Horsehide version of this exclusive LOST WORLDS design that has become a best-seller in its second year of production. Features, performance, versatility that simply cannot be duplicated at any price. And benchmark LOST WORLDS craftsmanship. 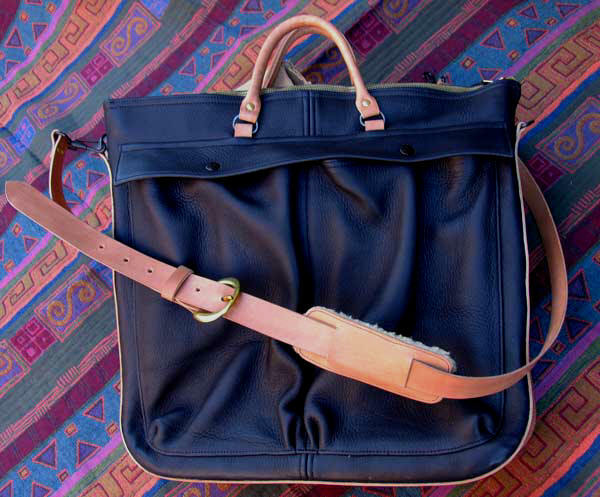 A bag for all seasons, all applications. 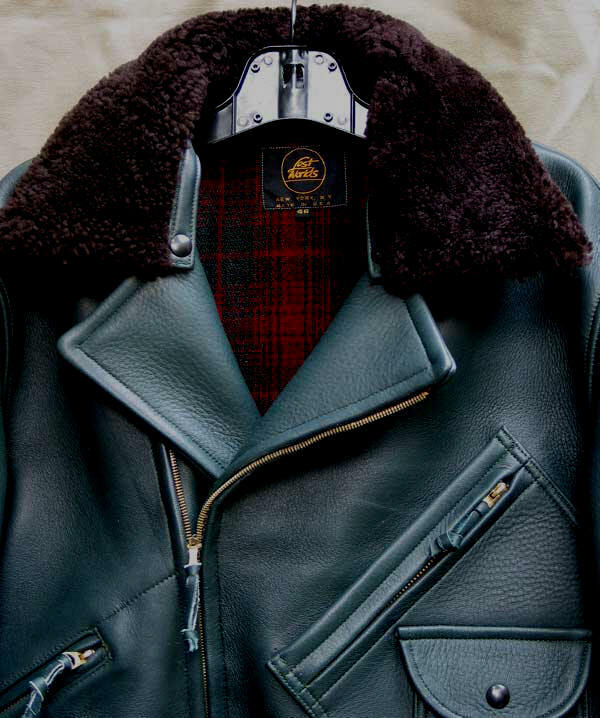 In order to allot our precious Finnish Moose Hide so that its limited footage finds its way into ultimate LOST WORLDS jackets, we chose the TROJAN MOTORCYCLE JACKET as the design to implement a full-bore, no expense spared masterpiece for a few very lucky guys. 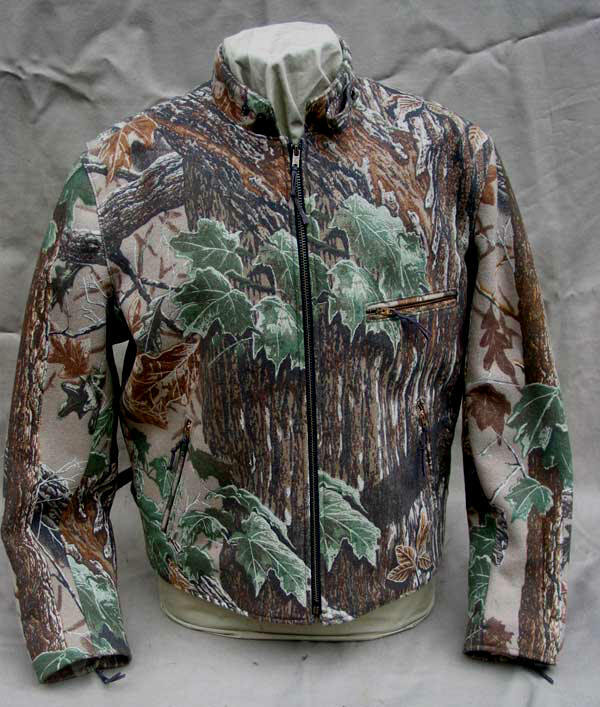 We wanted to make a jacket that would be legendary when we're dead and gone. 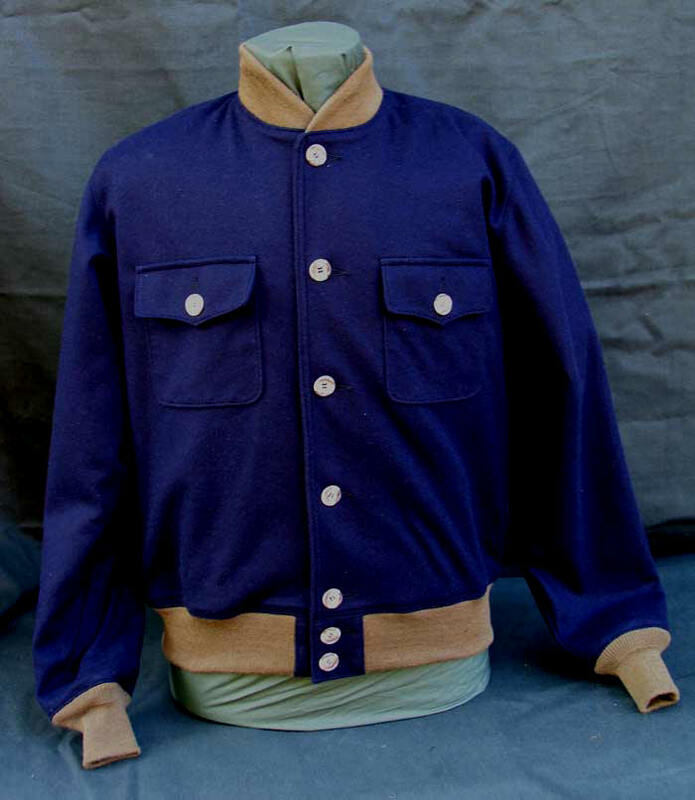 Something to find its way into some future book on extraordinary examples of vanished American craftsmanship. Is this pretentious? No, everyone should have goals like this -- to make a difference. What a difference! 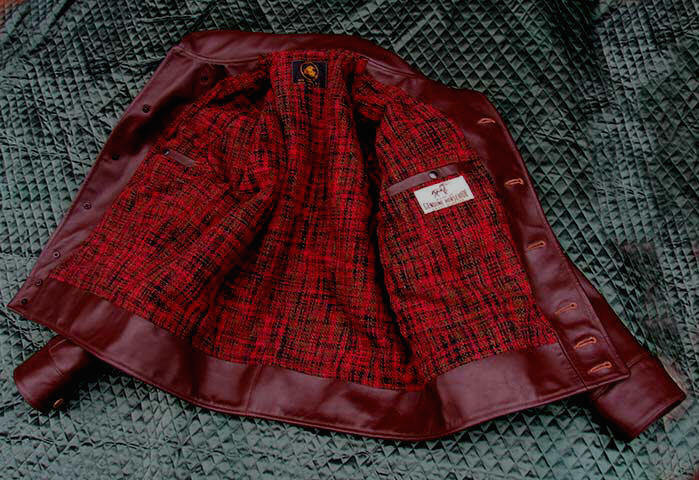 The stunning Evergreen 5.0 European Moose Hide -- so supple as to belie its high performance and strength -- is lined in our NOS 1950s Vintage Hunters Plaid Wool, Red/Dark Green, complementing the hide color remarkably. 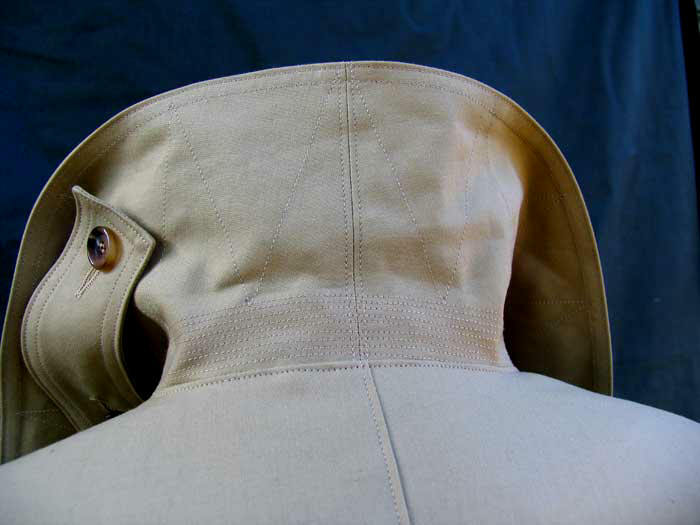 For zippers, NOS 1950s CROWN, the ultimate. 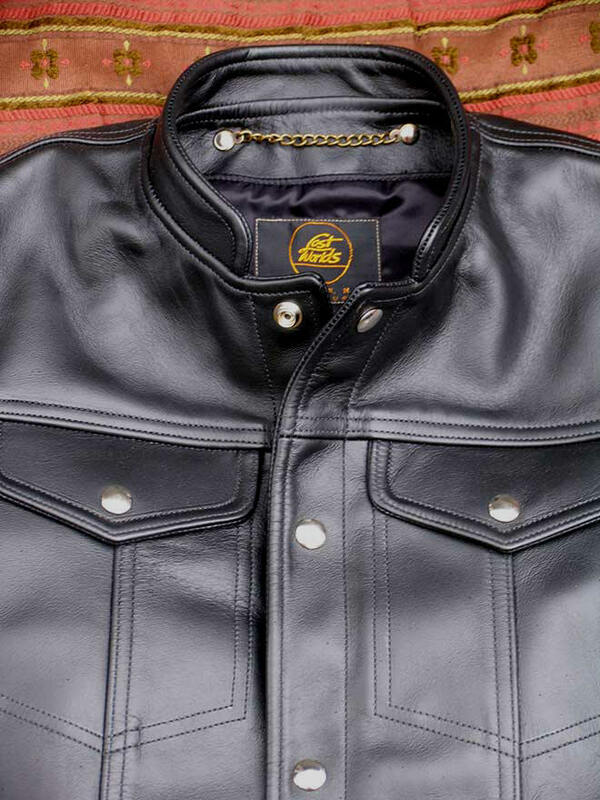 The #5 frontal zipper is spring-loaded, for which Crown is renowned. Brass gravity-lock C&C (Coats & Clark, ie. 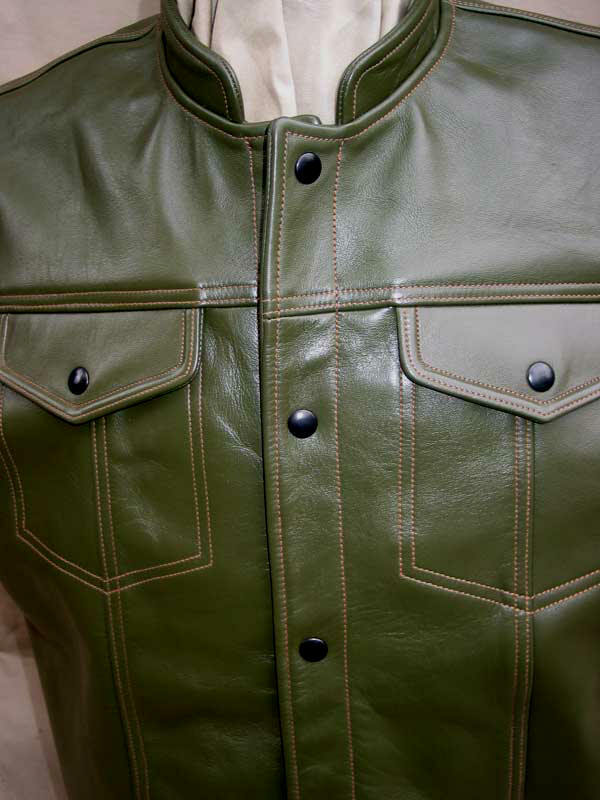 Crown) die-cut zippers for pocket and sleeves. 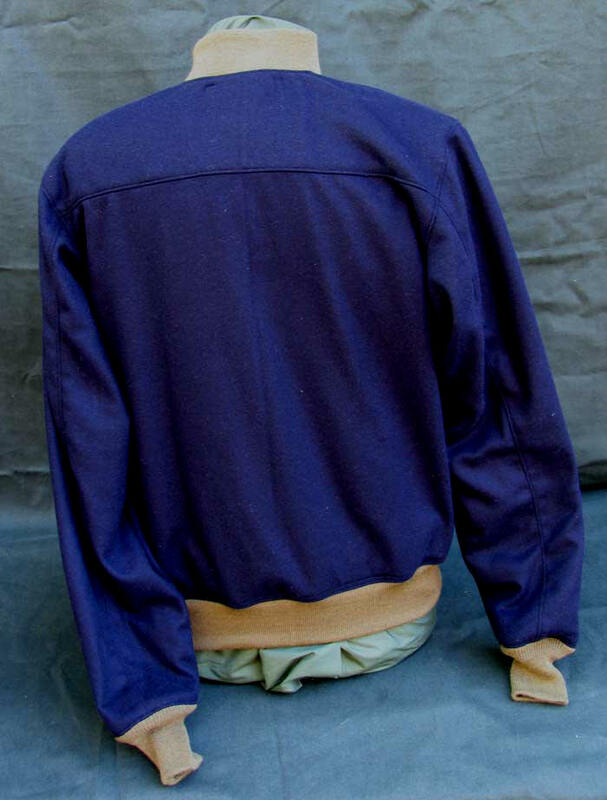 Detachable Mouton Collar. 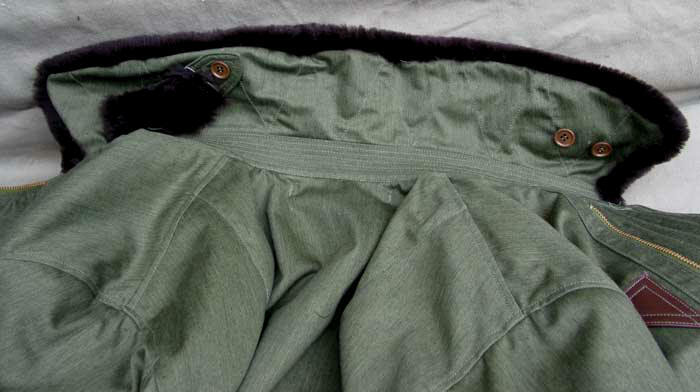 Matching Moose Hide Belt. The result is astonishing, pure and simple. Cheap, no. A bargain at the price? Yes. Obviously not for everyone but for those with the means, it will astonish, fill with joy and ride contentedly through storm and sun. 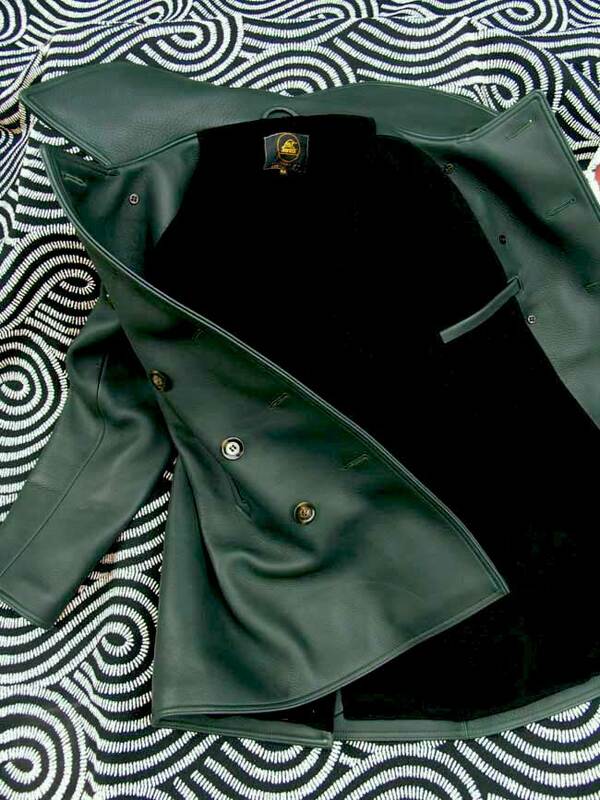 Super-magical version of our PEA COAT in genuine Finnish Evergreen Moose Hide, limited because the Moose Hide isn't free enough of holes and tundra markings to render large enough panels for three-quarter length jackets. 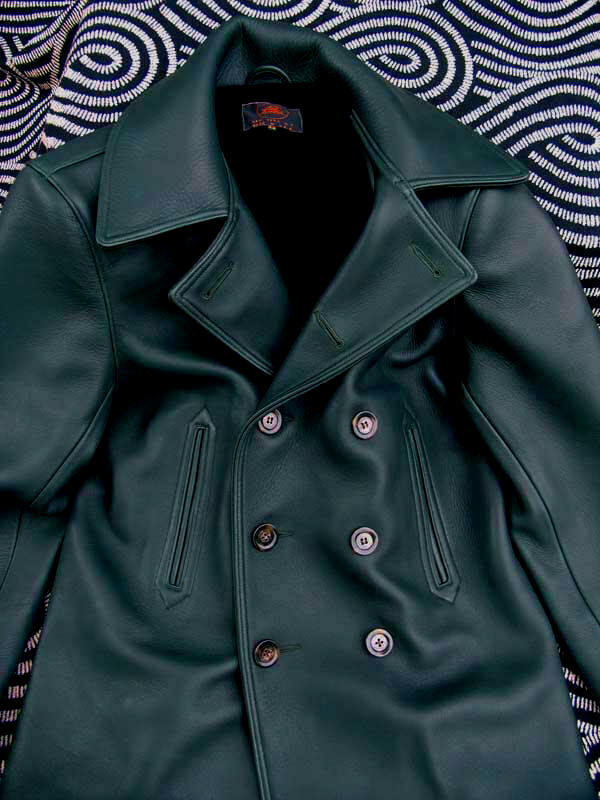 The result, though, is wondrous, a coat that imparts drape, comfort, solidness and truly remarkable craftsmanship without equal anywhere at any time. Sui generis, pure and simple. Lined in heavyweight Silk, Rayon or fabulous 100% Cashmere Wool (itself priced @$100.00/Yd) because the best deserves the best. This is one of those once-in-a-lifetime arrivals. Not for everyone, for only the very fortunate few. A landmark LOST WORLDS rarity of astounding visual impact and beauty. Draws stares and admiration like a magnet. 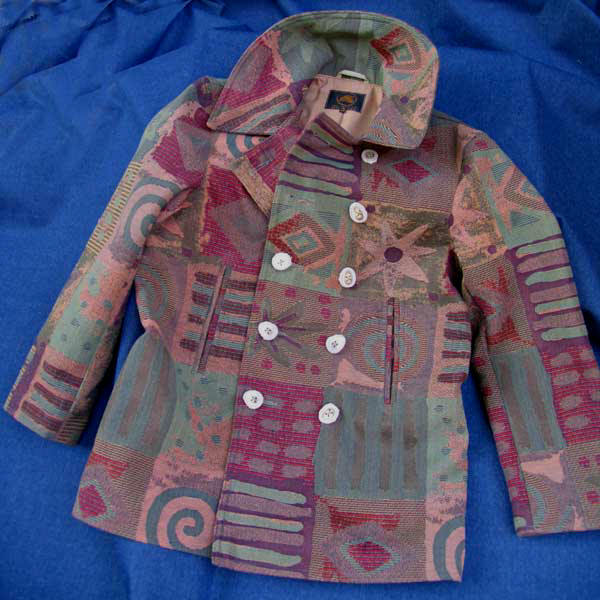 It blows our minds when we're sewing it! 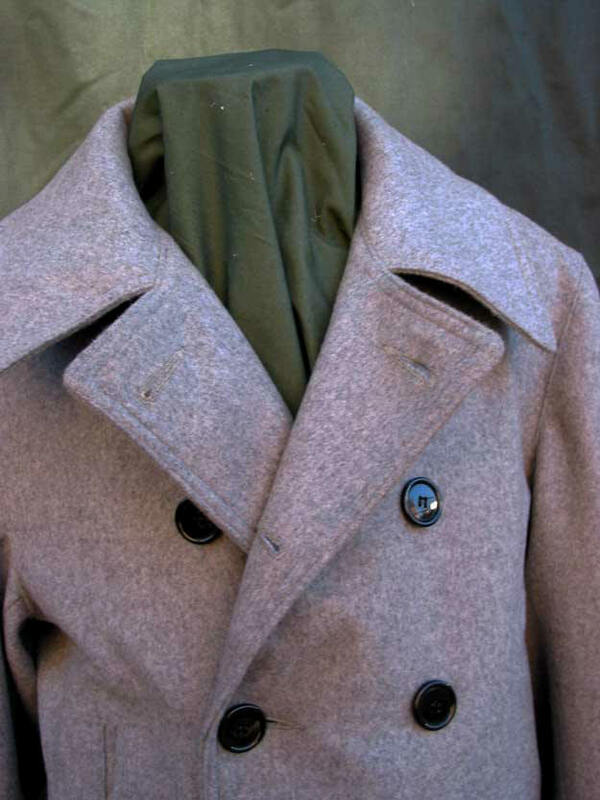 PLEASE NOTE: The shots of the Evergreen Moose Hide Pea Coat were taken in very bright light. Accordingly, they don't really accurately represent the color complexity fully. 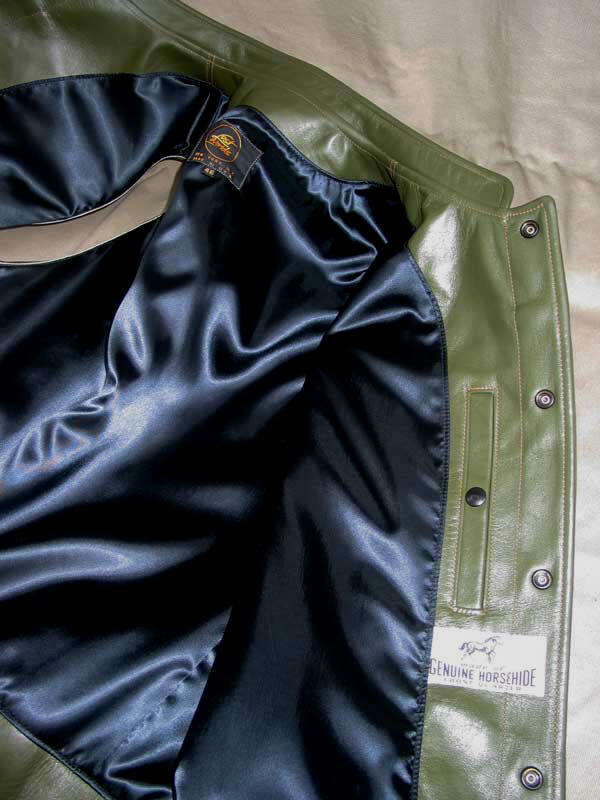 Visually collate these with the TROJAN MOTORCYCLE JACKET above to get an idea of the deep Blue/Green quality. 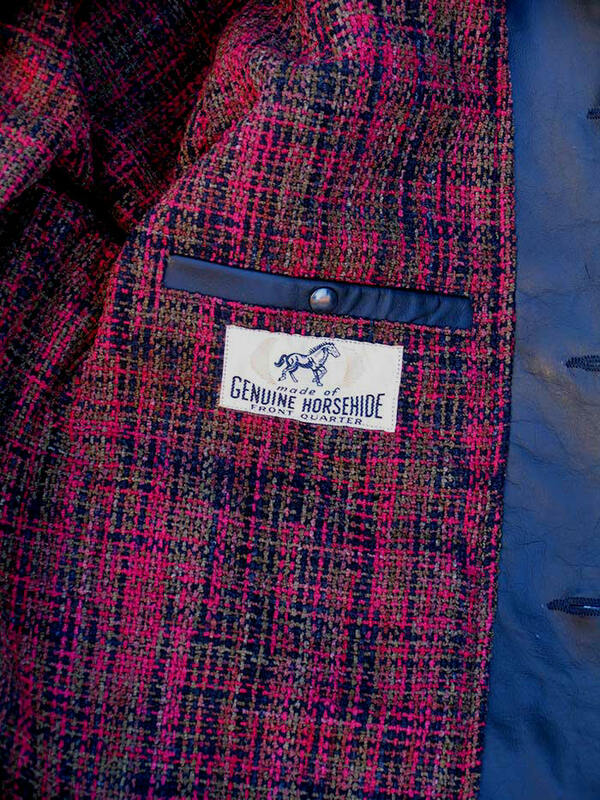 We have customers who both ride and hunt so we unearthed this beautiful vintage hunting wool in distinctive woodland pattern for these guys and everyone else. The comfortable cut and perfectly functional biswing back/underarm gusset construction make our Easy Ryder a natural for road and field use. What's also nice is that when you're riding, the guy and his wife in the minivan behind you could, depending on the landscape whizzing by, mistake you for a torso-less rider. Lost Worlds gear is nothing if not fun. 100% Flight Satin Nylon Lining for additional comfort, durability and strength. Incomparably soft yet heavyweight 3.5 oz. 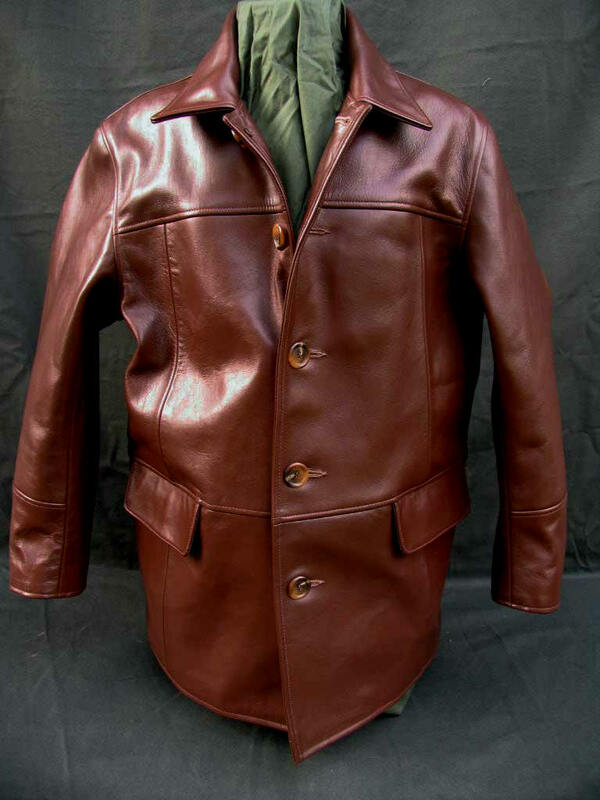 American Deerskin DOWNTOWN CAR COAT done the LOST WORLDS way. Fabulous drape, comfort, profile, unobtainable for twice the price (and at least half the quality) with some fashion label. 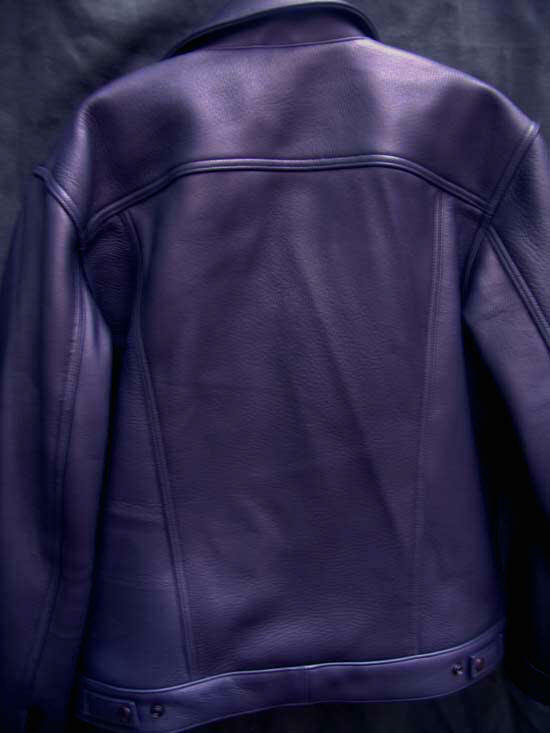 Lined in durable, luxurious Silver Gray Morning Silk Satin -- for leather this unique, with matchless drape, requires a lining of similar quality lest it be diminished. 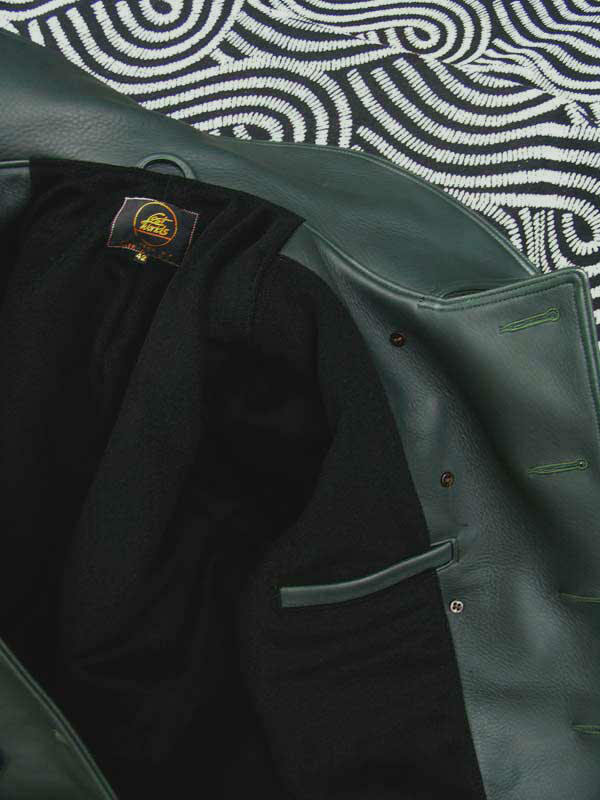 The balance between the leather and the lining is always a factor. 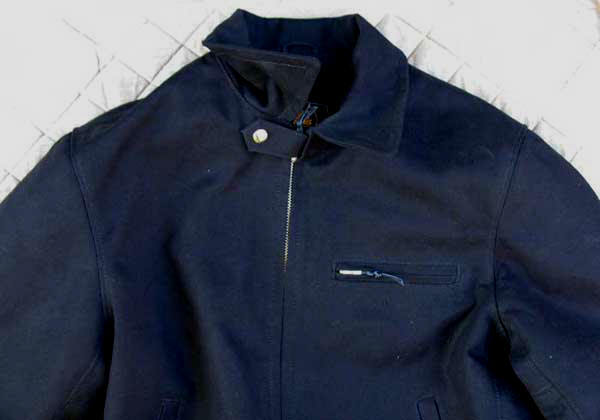 In our jackets every material and component contributes to the overall excellence and is selected without regard for cost, only for quality and suitability. 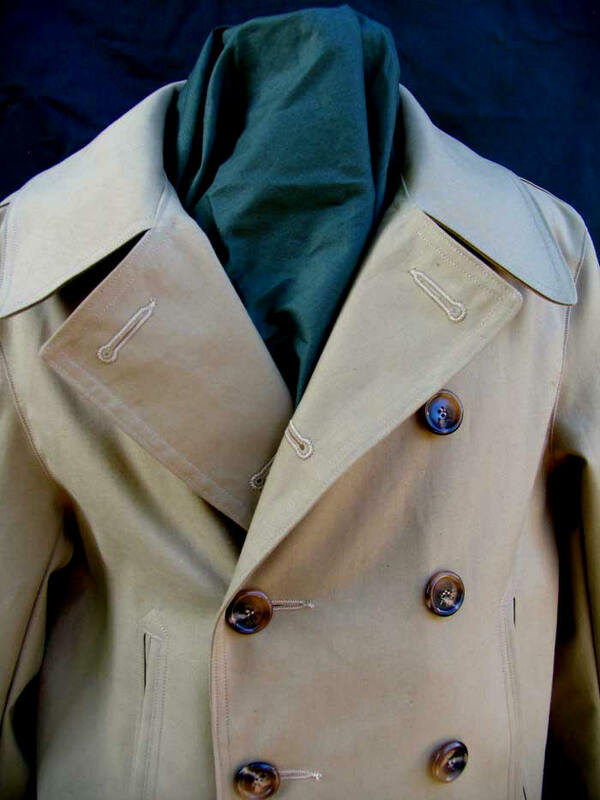 The Deerskin DOWNTOWN is a coat that commands (and by a wide margin) but doesn't overstate. Yet its detailing, line and construction catch any eye with a modicum of taste and background. This is classy, cool and timeless. Brilliant price too for an all-American masterpiece of craftsman quality (or is it Snap-On quality!). 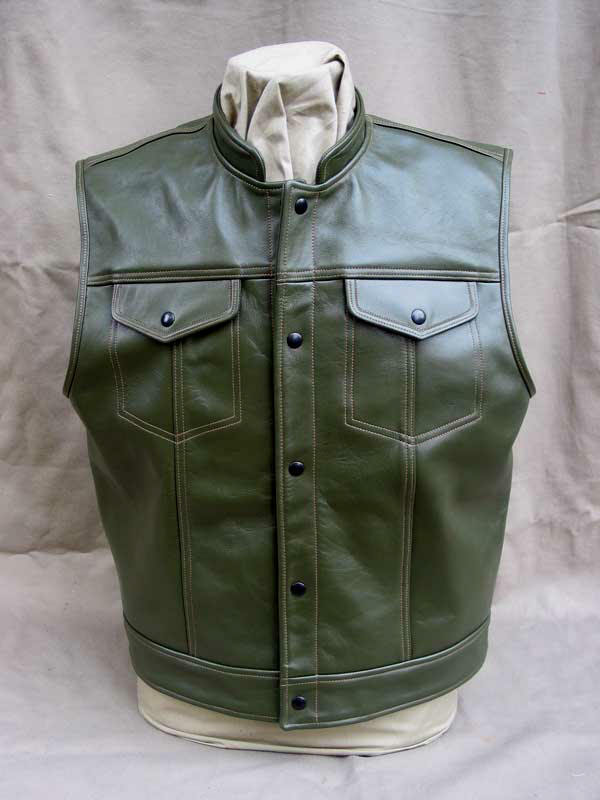 CUSTOM JEANS/MOTORCYCLE VEST Sizes 38-48 Olive Horsehide. Brand New. 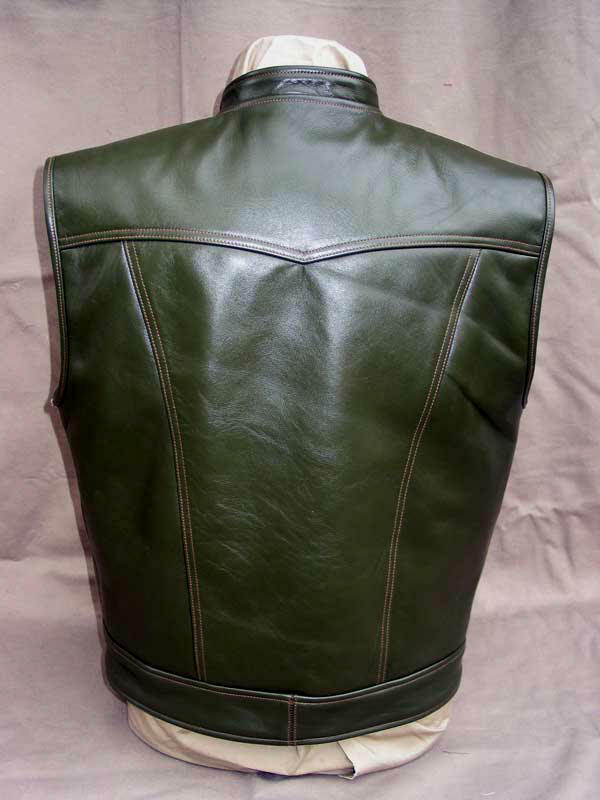 We don't have enough of our gorgeous Olive Horsehide to do customer jackets but we can make a small run of vests in this hide, up to 5, we think. So another unique LOST WORLDS here for your inspection. 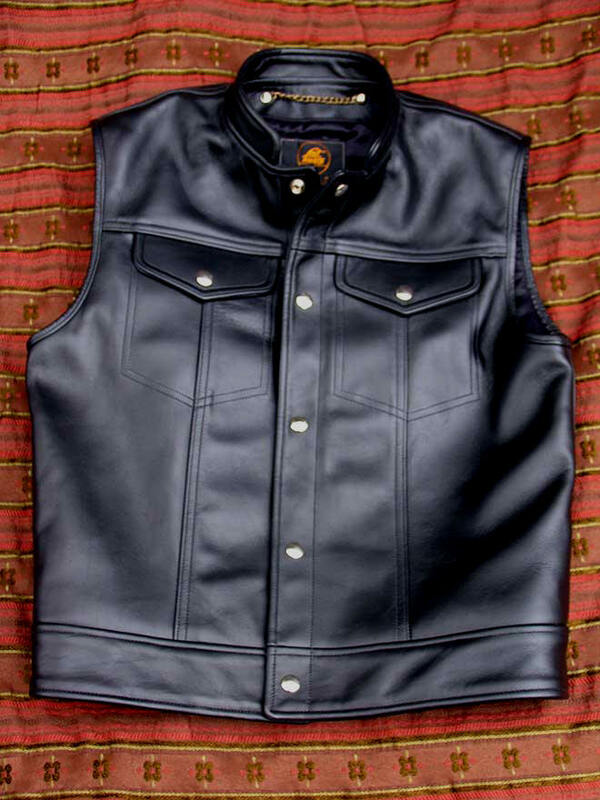 Our heavyweight horsehide vest sparkles on the road or behind the wheel as it's really more a sleeveless jeans jacket than vest. Lined in 100% Flight Satin Nylon. 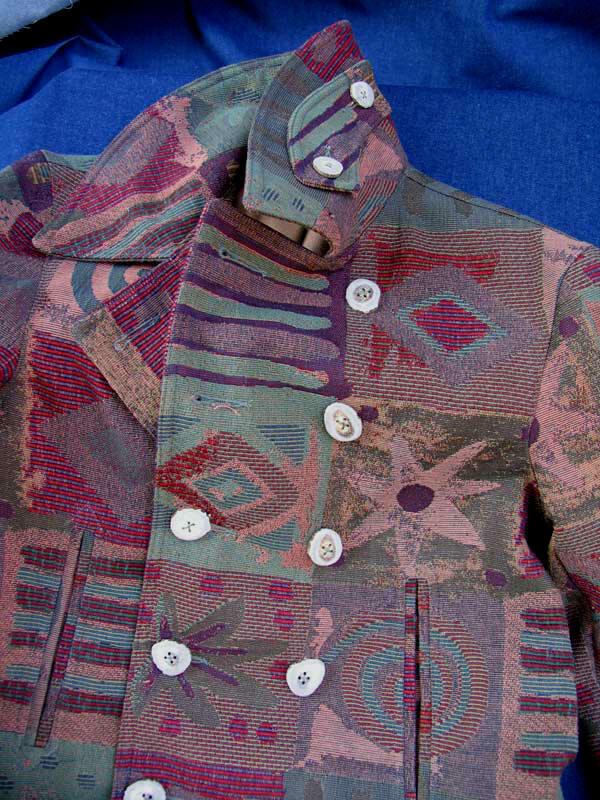 Contrast stitch work. Interior snap pocket. Optional neck chain. Macho but refined as all hell. Amazing workmanship. 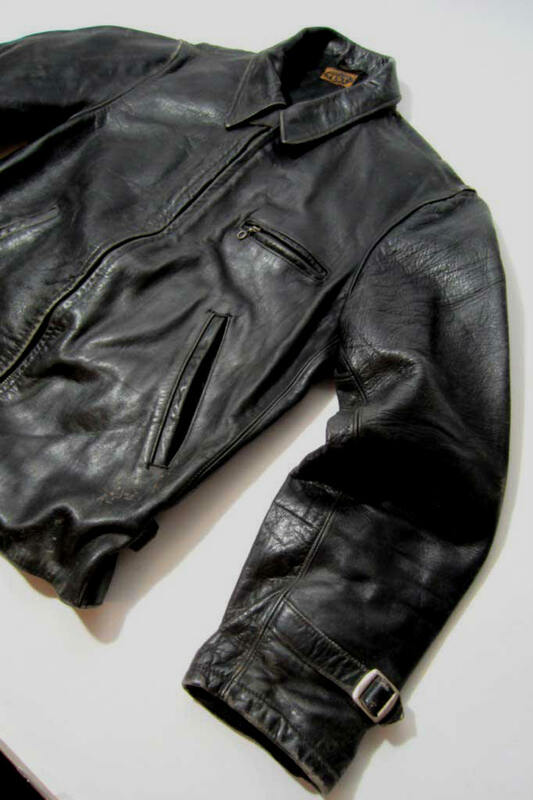 VINTAGE 101J-TYPE JEANS JACKET Black Horsehide. Lined in 100% Flight Satin Black Nylon. Copper buttons. 46R. 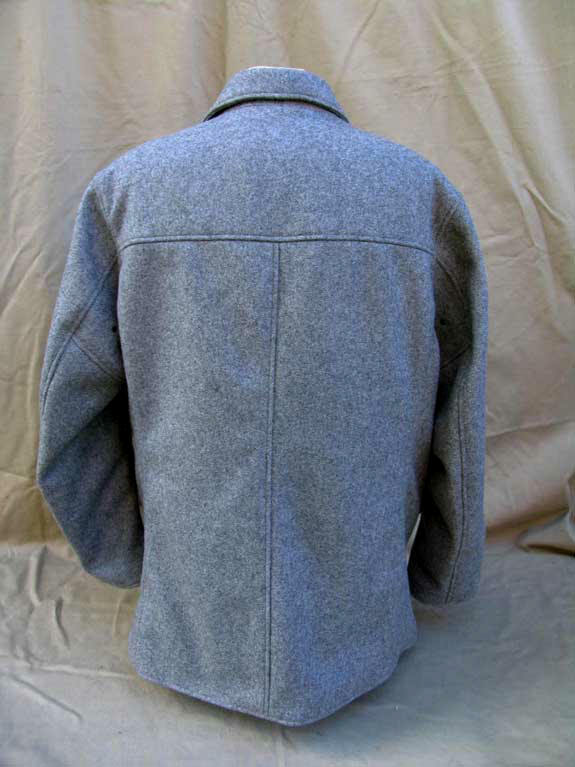 Genuine 100% Harris Tweed Wool, Gray Heather color. Morning Silk Lining. 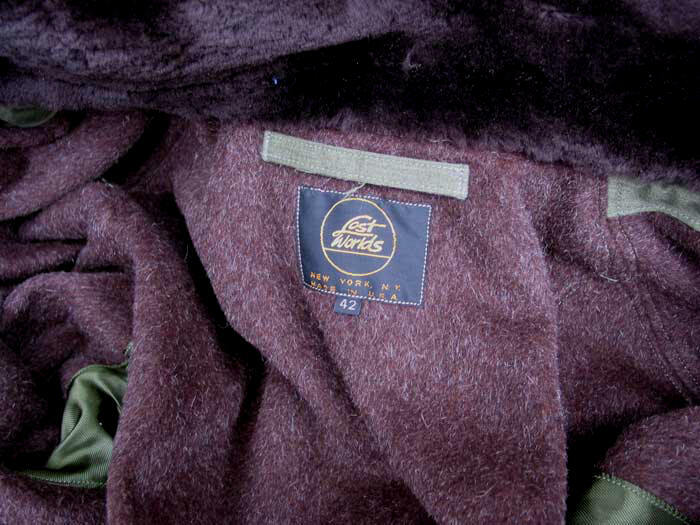 Several years back we did a tiny custom run for a Japanese company which provided this beautiful numbered, registered heavyweight Harris Tweed. We just found a small roll of leftover wool from that job and thought it would serve well in our Downtown. Which indeed it does, becoming a one-of-a-kind Lost Worlds treasure wearable anywhere. Duplicated, of course, nowhere. 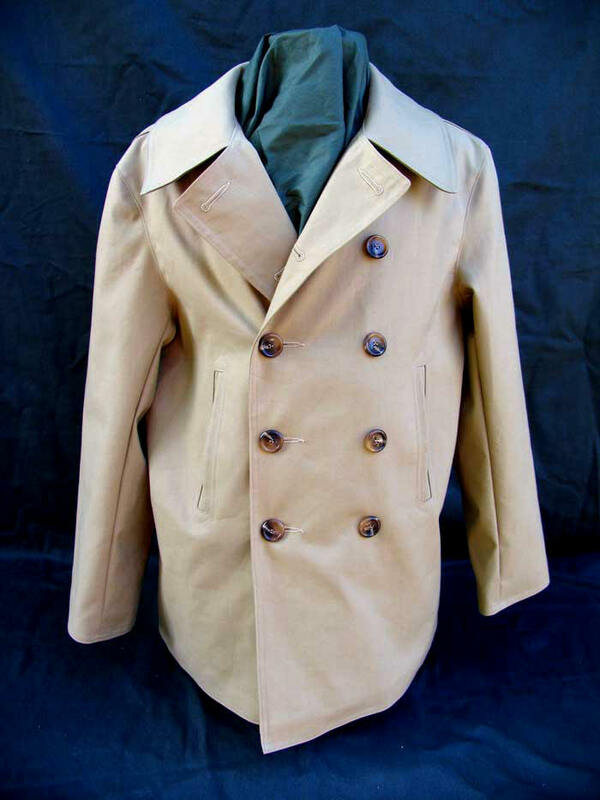 PEA COAT CUSTOM 15 oz. 100% Cotton Duck. 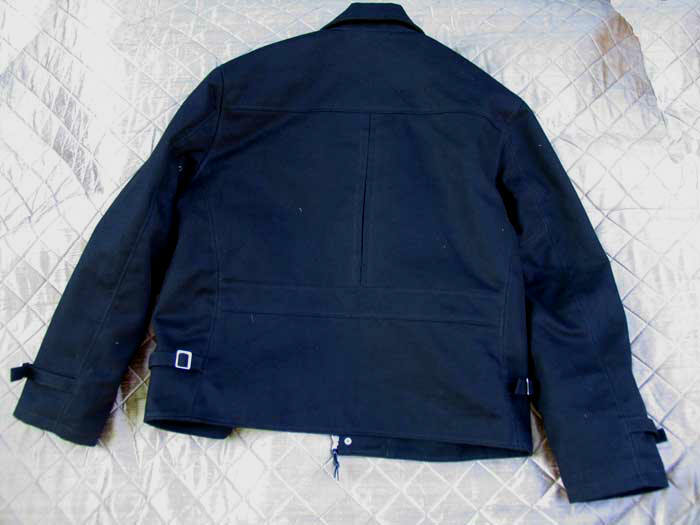 Dark Brown, Navy, OD, Black. 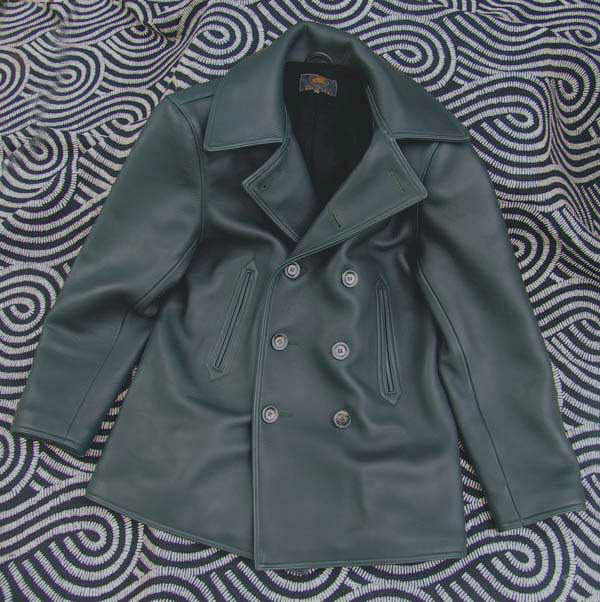 A very special and unique Custom Pea Coat design we sampled for a Japanese company but never put into production because the manufacturing costs were so high and the customer couldn't manage it. Their loss, your gain. 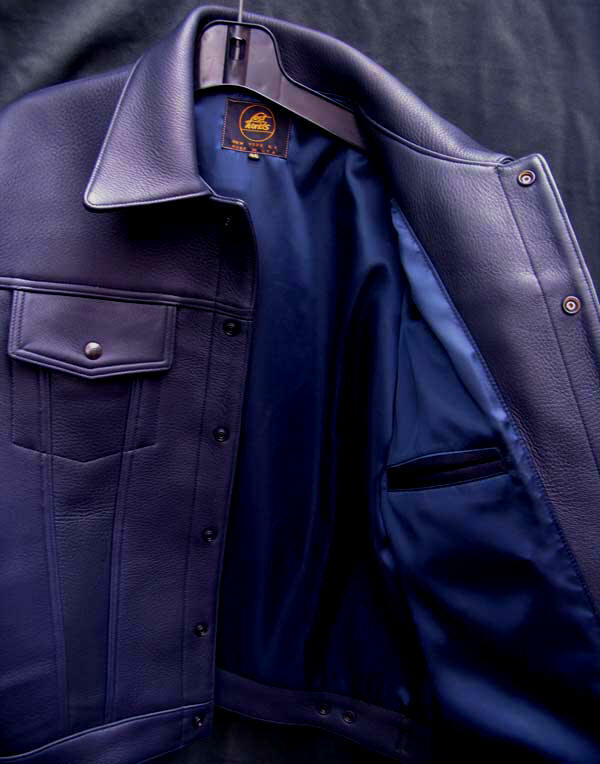 Check out the one-of-kind details: fantastic arched button front that curves as it rises. 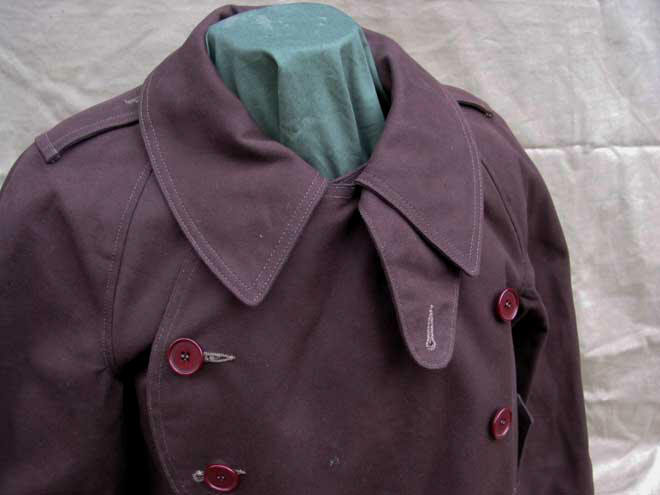 Buttoned epaulets with oversized neck flap. 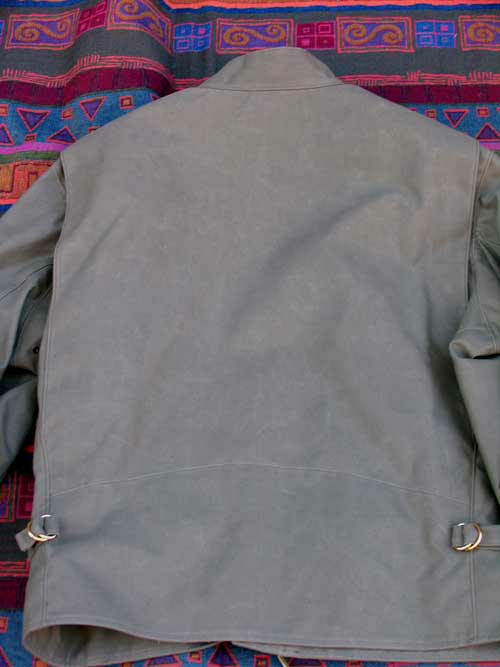 Buttoned flap pockets with outline stitch. Adjustable cuffs. 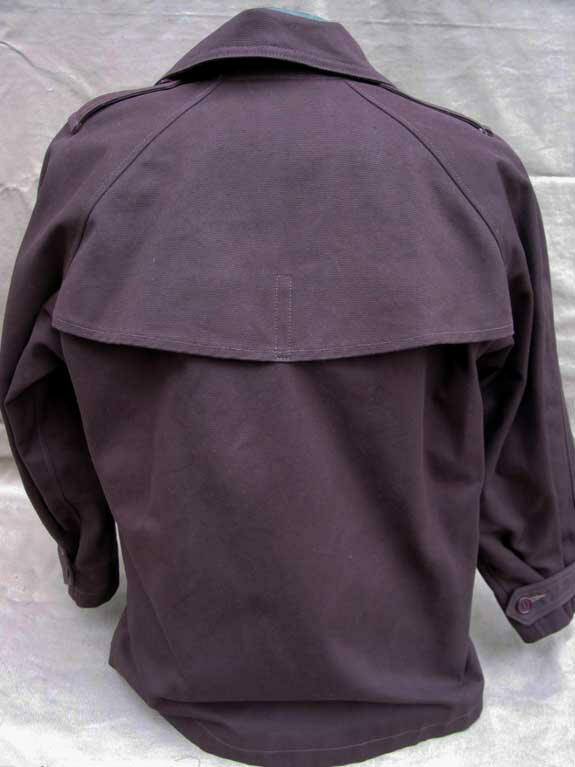 Cape Rear Shoulder Yoke. 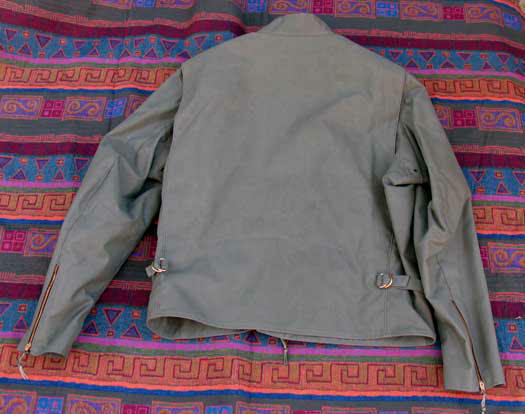 Lined in our waterproof military Quarpel OG lining. 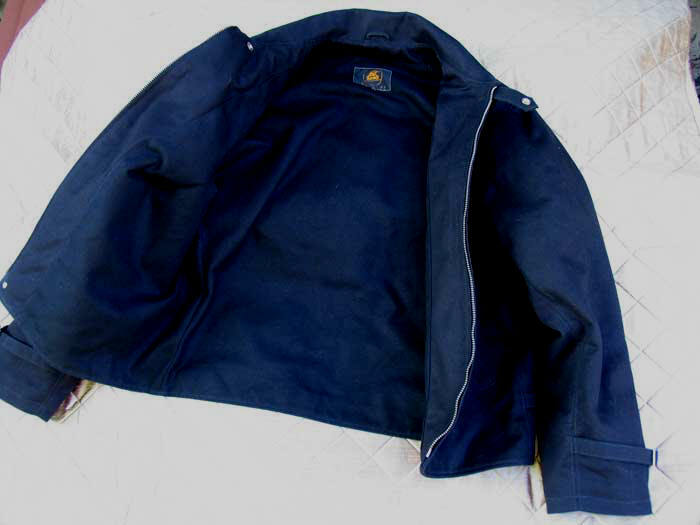 Really rugged, heavyweight cotton. One high-performing, tough-looking but smashingly cool and distinctive LOST WORLDS custom design. 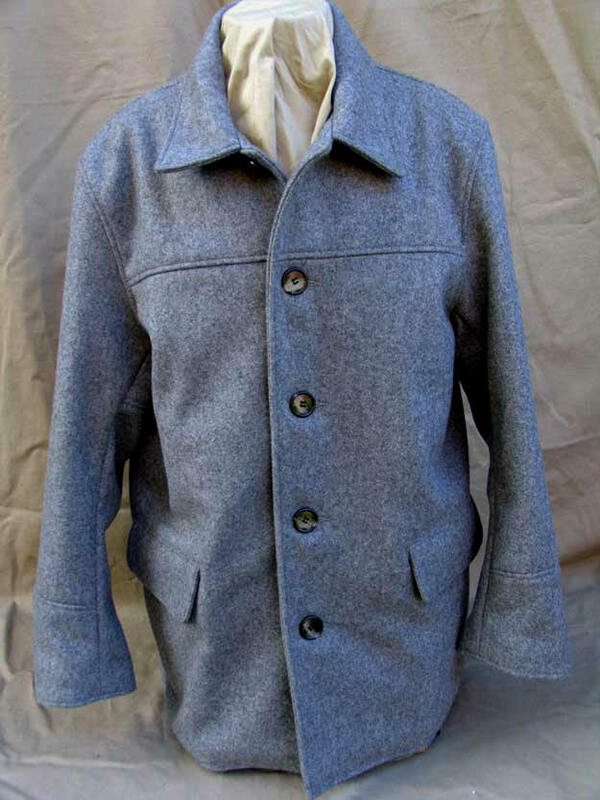 PEA COAT Sizes 38-48R Gray Cashmere. 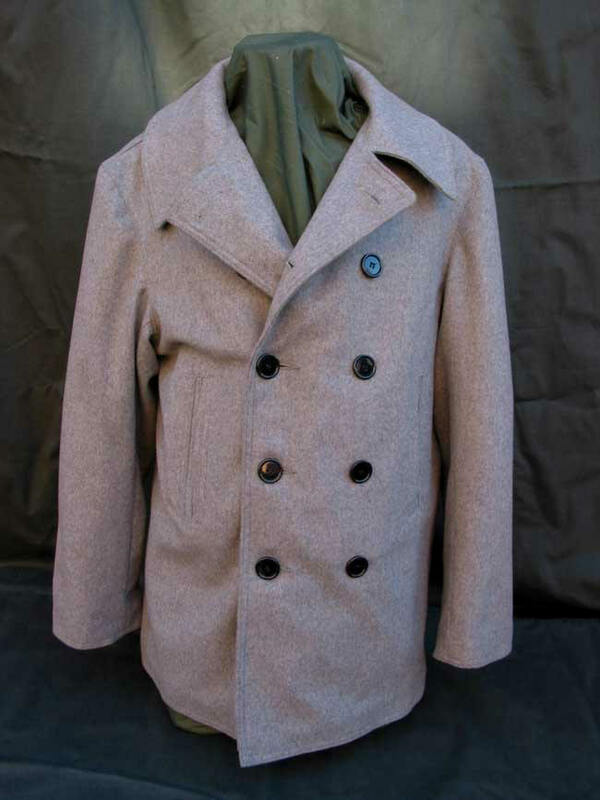 An absolutely stunning, peerless lightweight 80% Cashmere/20% Virgin Wool LOST WORLDS Pea Coat. Soft as down. Perfect for any occasion, from jeans to formal. Gorgeous workmanship. 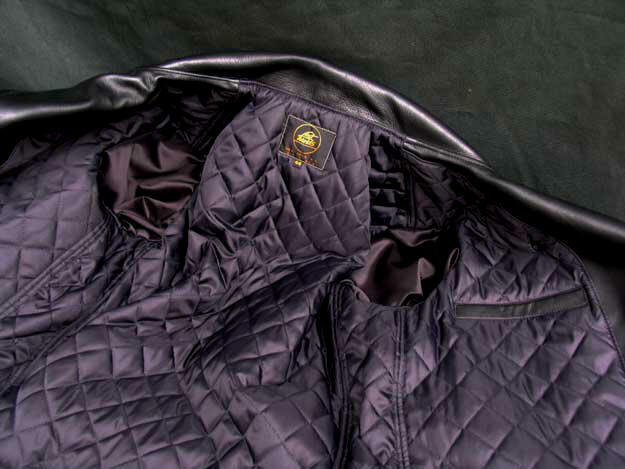 Silken 100% Flight Satin Nylon Lining. We only have a single roll of this wool, enough for 7-10 coats. 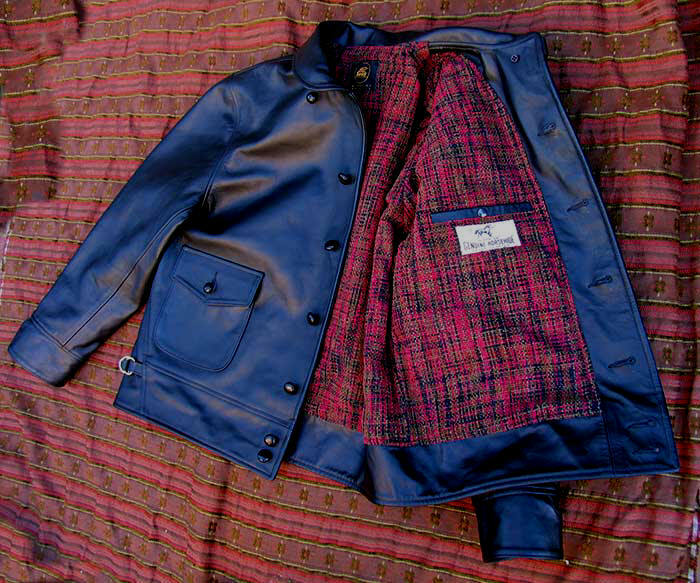 Compare our price for a Made In USA gem to anything else out there with comparable quality and wool. The drape of this beautiful Cashmere will garner accolades wherever you go. Yet all man, nothing effete about it. 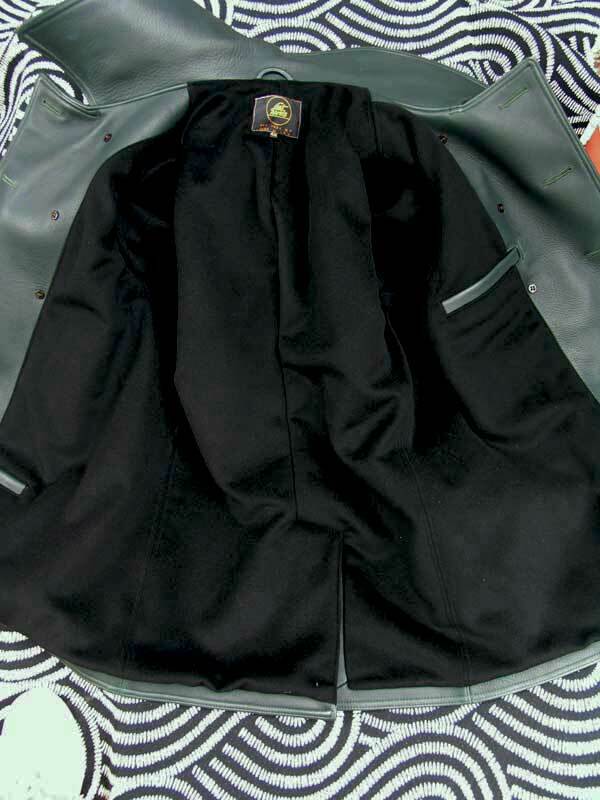 DOWNTOWN CUSTOM CAR COAT 38-48R. 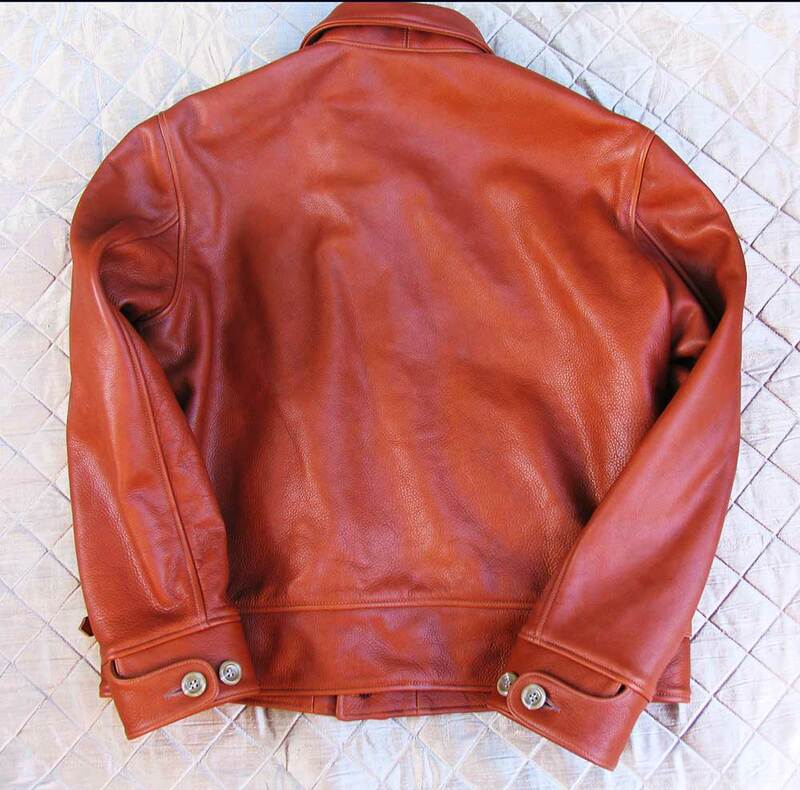 Black or Russet Horsehide. 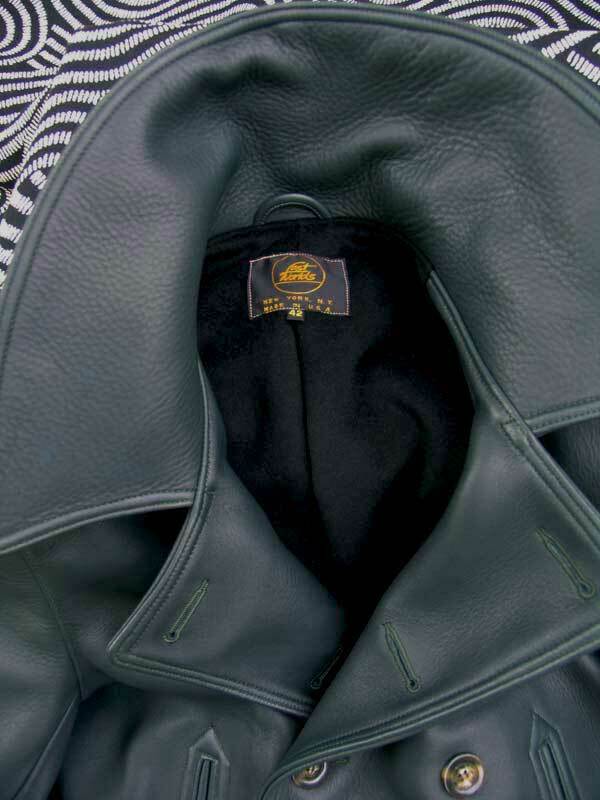 Years back we did a very small run of these coats for an exclusive shop. They were very expensive, made to the shop's requirements, which included large modifications to our regular DOWNTOWN. 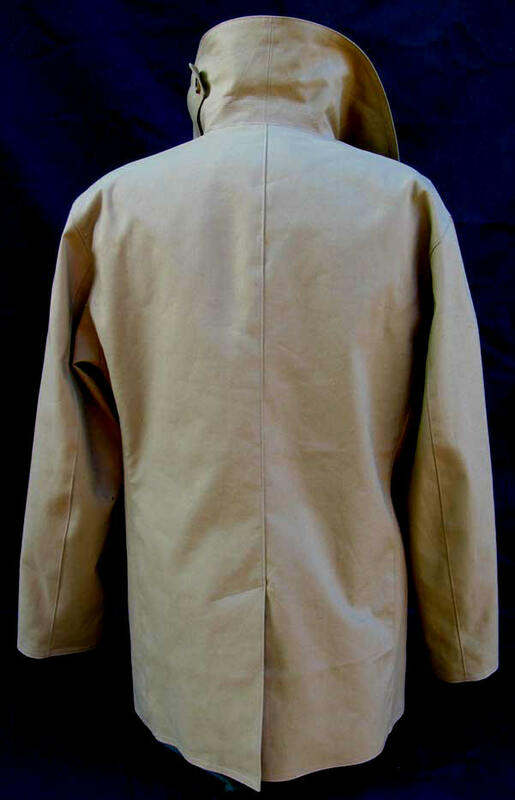 With added panels the front and back became dramatically different, making a very stylishly different coat. The rear horizontal faux belt panel is really very right. 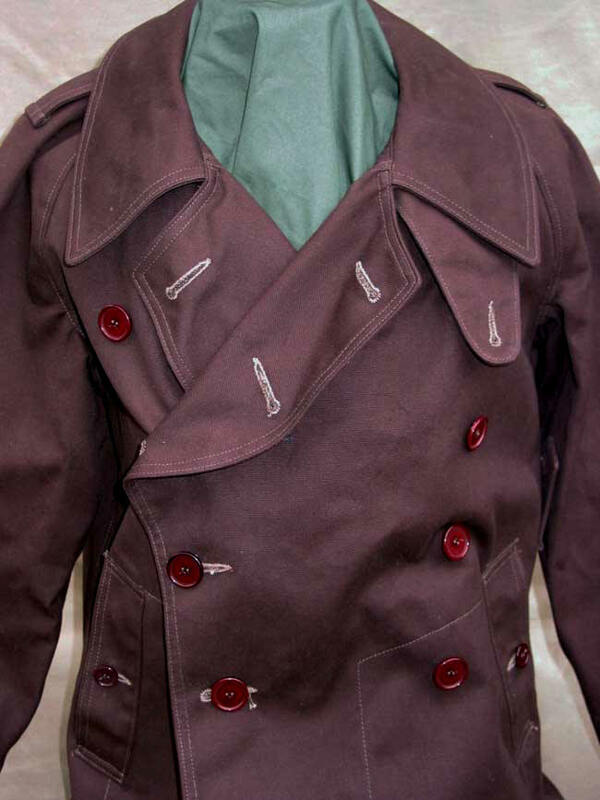 Sturdy, masculine-looking coat. All the detail mods, in fact, worked great. Killer too is the price. 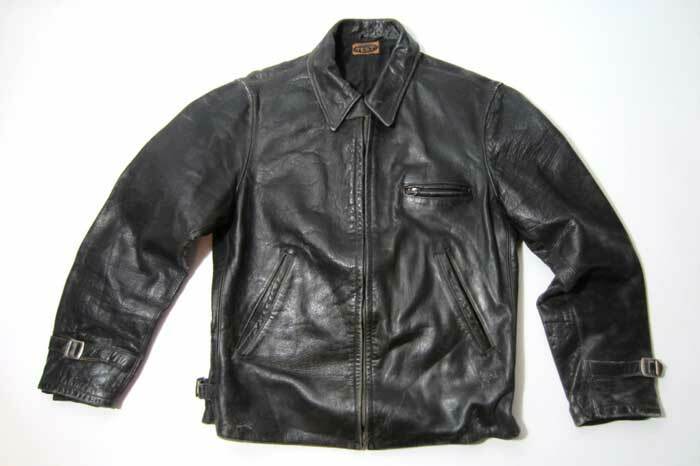 We found a small quantity of already cut horsehide, long forgotten. 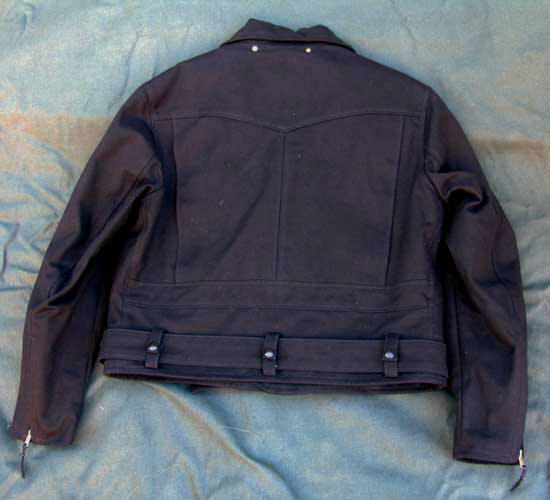 A-1 Flight Jacket 38 through 48 Regular, Navy Camel Hair. 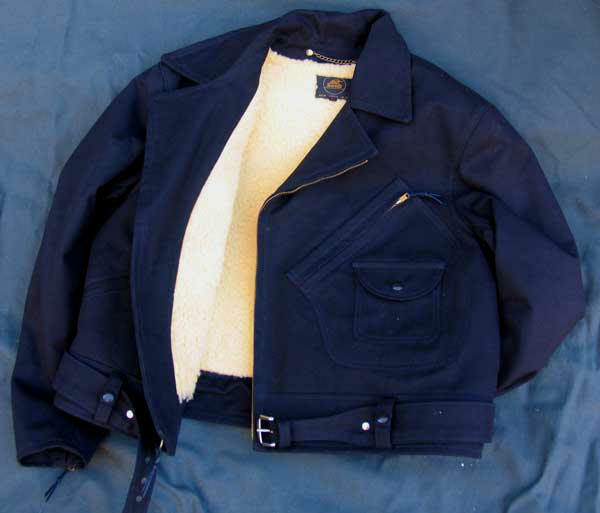 For years we've done wool and cotton versions of our flight jackets for wholesale customers. 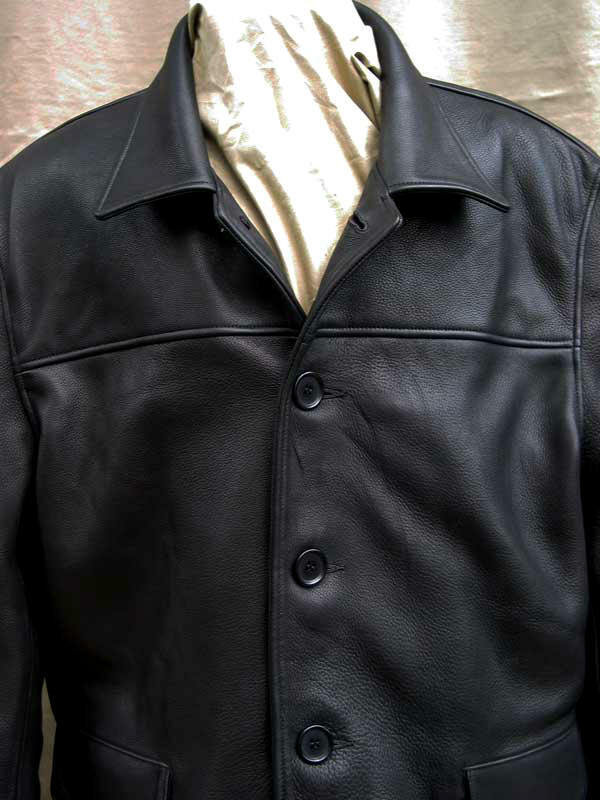 The A-1 is a perennial favorite and works especially well in fine wool, like this 100% Camel Hair version. 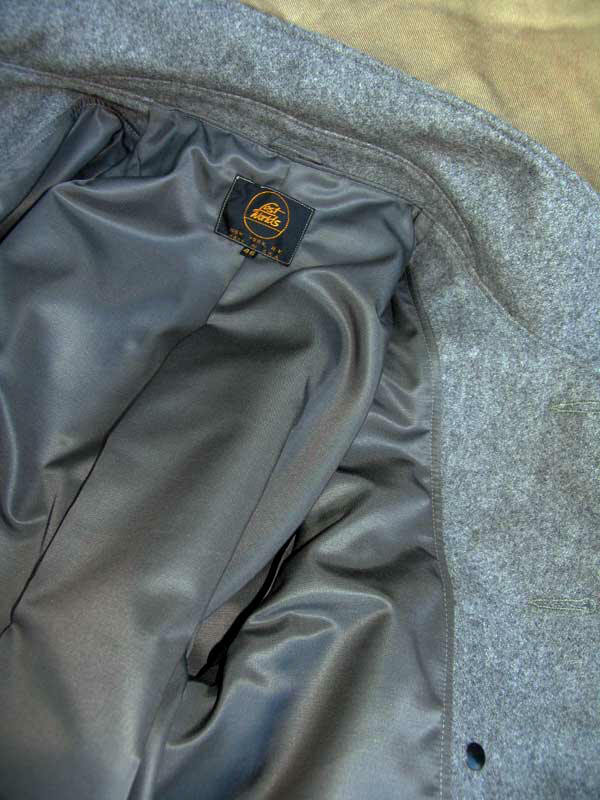 Our Camel Hair has a velvet, almost velour softness yet with great rain resistance and not fragile. Just a beautiful, comfortable drape and matchless hand. 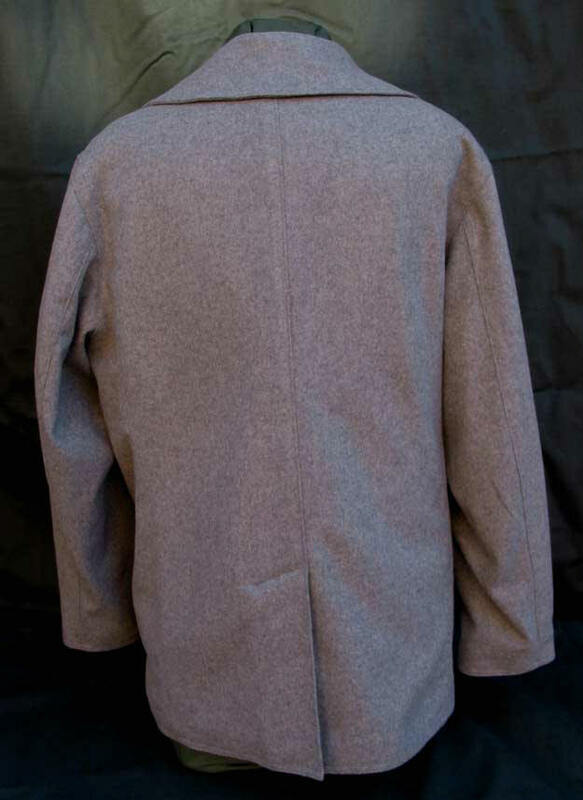 Lined in 100% Khaki Bush Poplin Cotton, 100% Wool OD Knit. 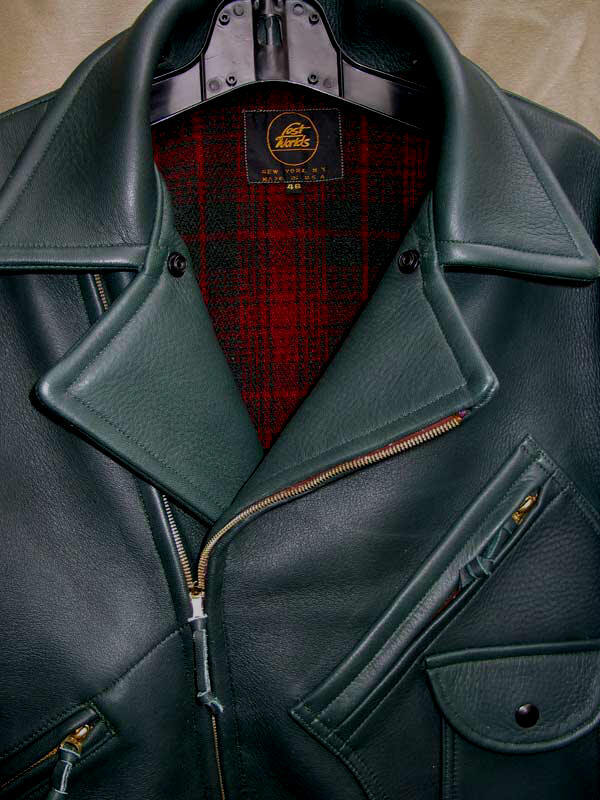 With its classic American trim fit and cut, this A-1 has no competition that we can think of for craftsmanship, style, quality and exclusivity. Flatters every build. 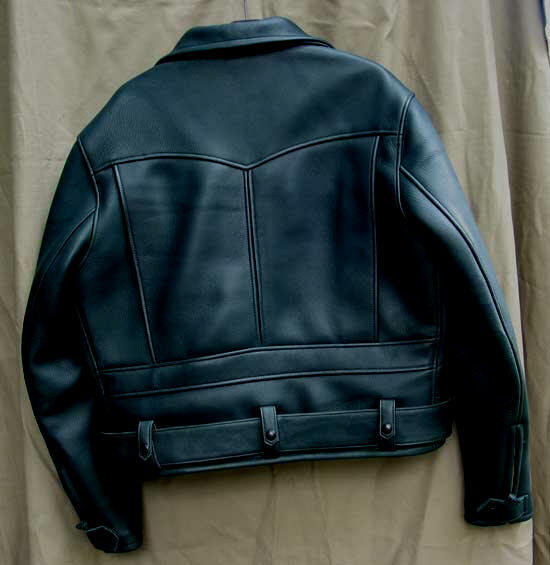 B-15A FLIGHT JACKET Sizes 36R through 48R. 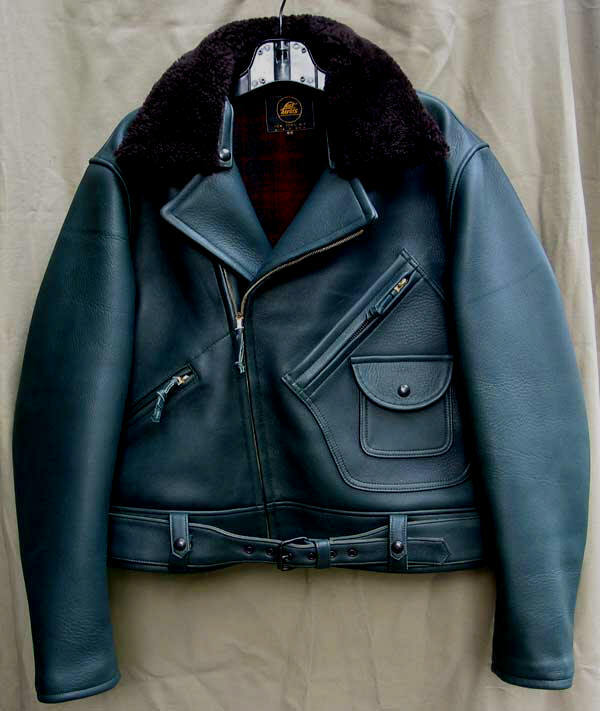 In the mid-1990s we made a handful of B-15As for an overseas shop. Due to interested queries over the years we decided to do a small run of our superb B-15As again. Collectors will appreciate our dedication to the fineries of this WWII AAF design. 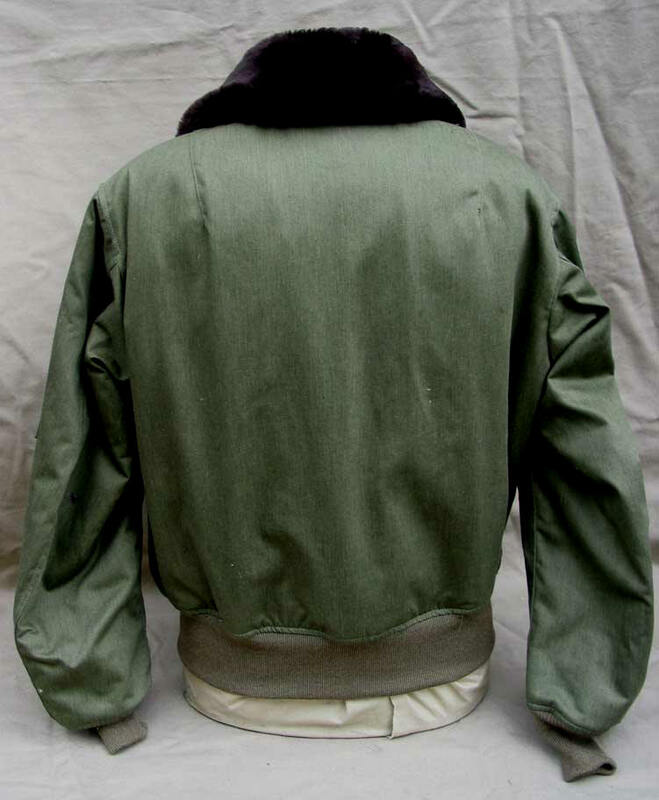 The shell is made of a 100% Vintage NOS Cotton US Army OG Sateen over forty years old. 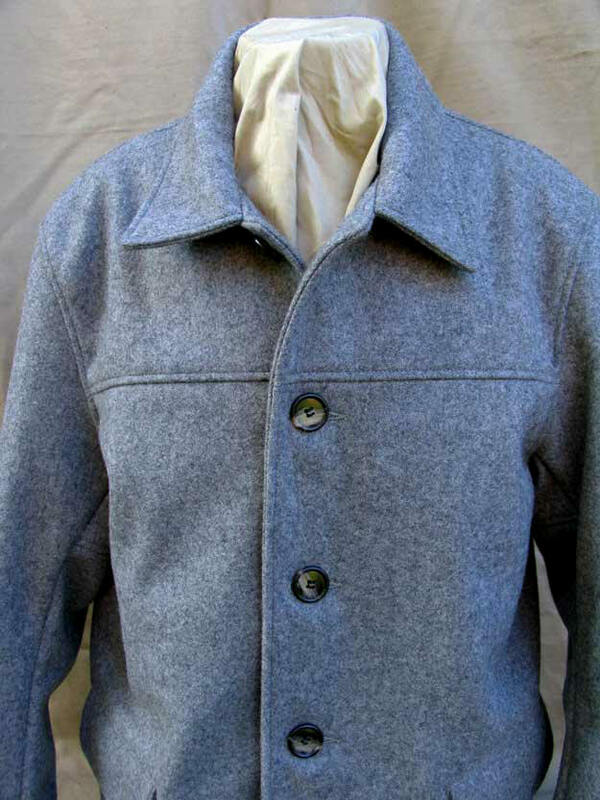 The lining is the fantastic woven Alpaca. 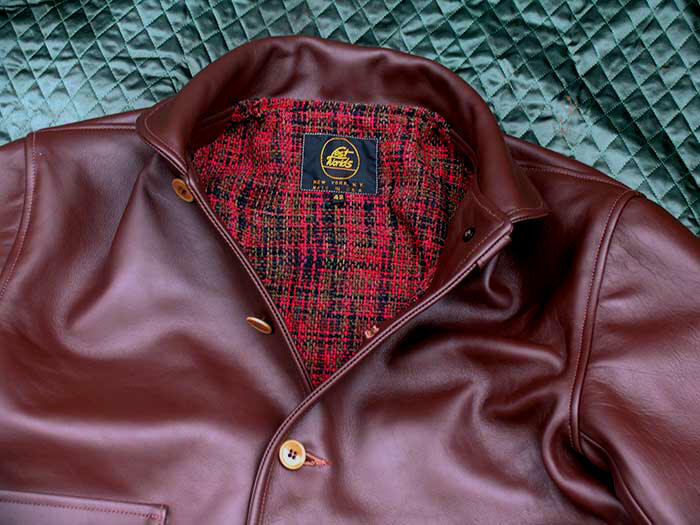 100% Genuine Mouton Collar of course and matchless 100% Wool OD Knit. Brass Talon Zipper. Genuine antique US Army melamine buttons. Original Pull-the-Dot radio cable clips. 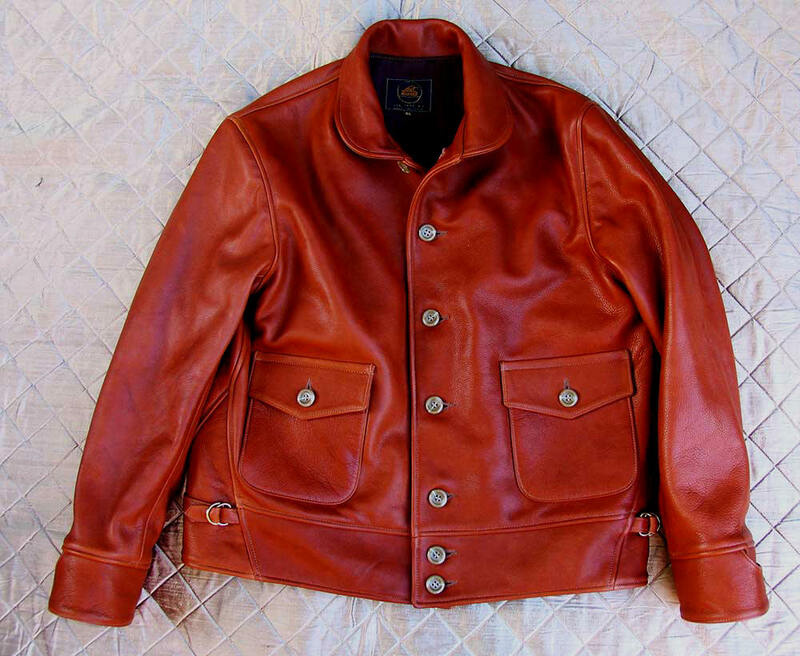 Russet Horsehide microphone tab. 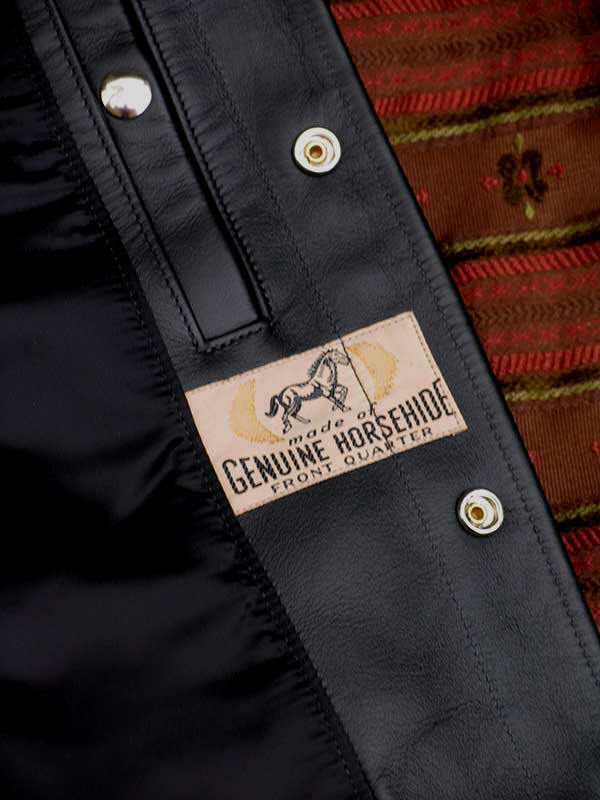 You'll notice that we do not reproduce an original WWII label or apply the AAF heat transfer to the shoulder. We can't afford to on the numbers of these we can make. These are for collectors and cognoscenti who know how fantastic original B15As were. 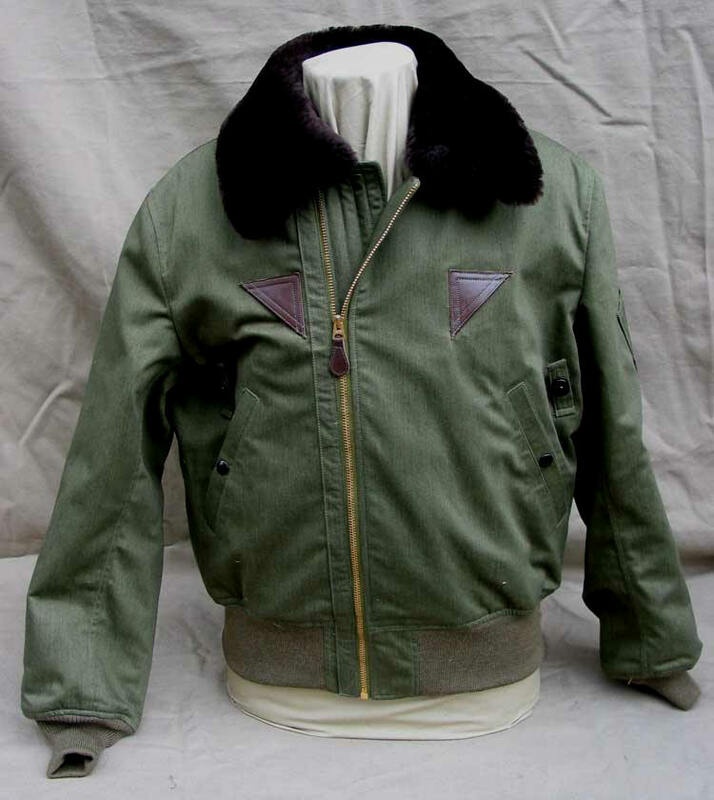 Pilots routinely replaced the immortal A-2 with this warmer, more comfortable and more ergonomic flight jacket. 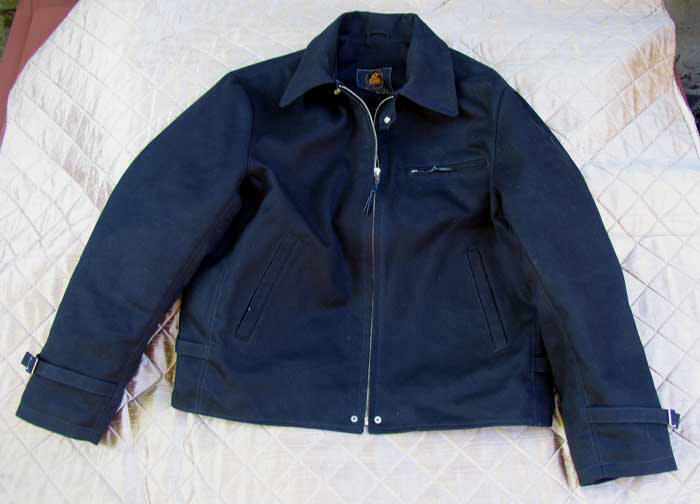 An unbelievably rare and desirable LOST WORLDS jacket.